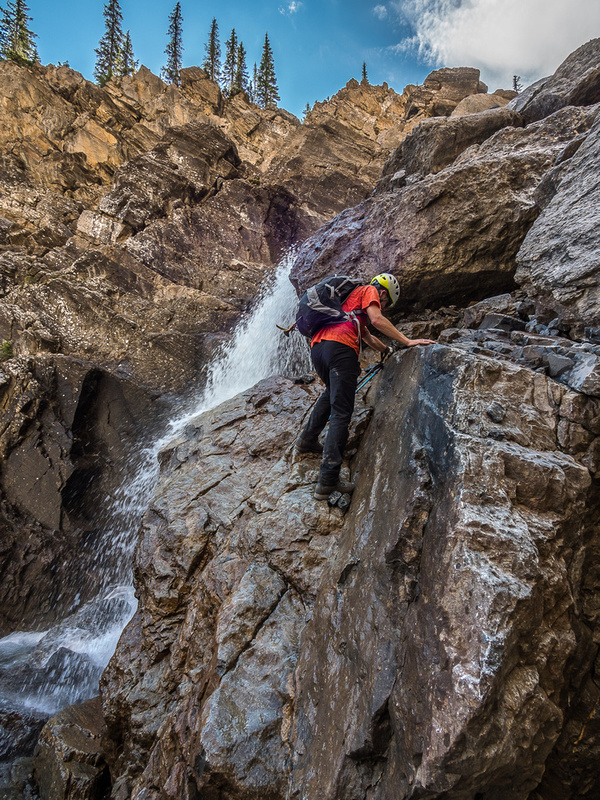 Difficulty Notes: A very remote off-trail hike and scramble involving high-consequence terrain, route finding and numerous river crossings that are liable to rise significantly during the day. Apparently I’m not the only one either. In this case, so did Phil Richards. 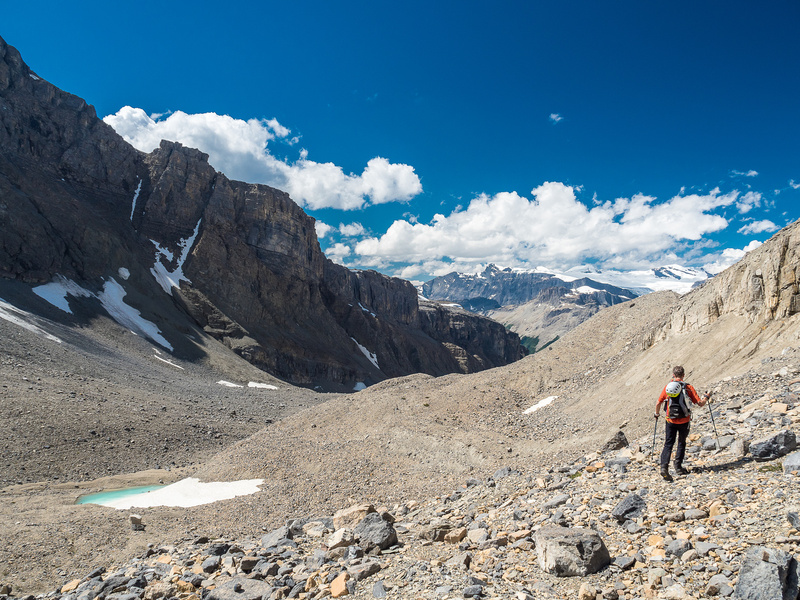 After first becoming interested in Breaker Mountain in 2013 while perusing Google Earth for ideas, Phil took Rick’s trip report on Bivouac (a 1987 spring ski ascent) and successfully completed an ambitious solo trip up Capricorn Creek to Capricorn Lake in October 2014 to scout the route to the Parapet / Breaker col. Thanks to intermittent snow flurries at Capricorn Lake and an impending snow event he never made it as far as the col. Ever since then, Phil has been trying to find a partner to suffer the approach with him and try to find a scramble route up Breaker. Finally, for reasons still unknown to me, I agreed to his suggestion and we each booked off work for Friday August 5th to make the attempt during a good weather window – a rare thing in summer 2016. 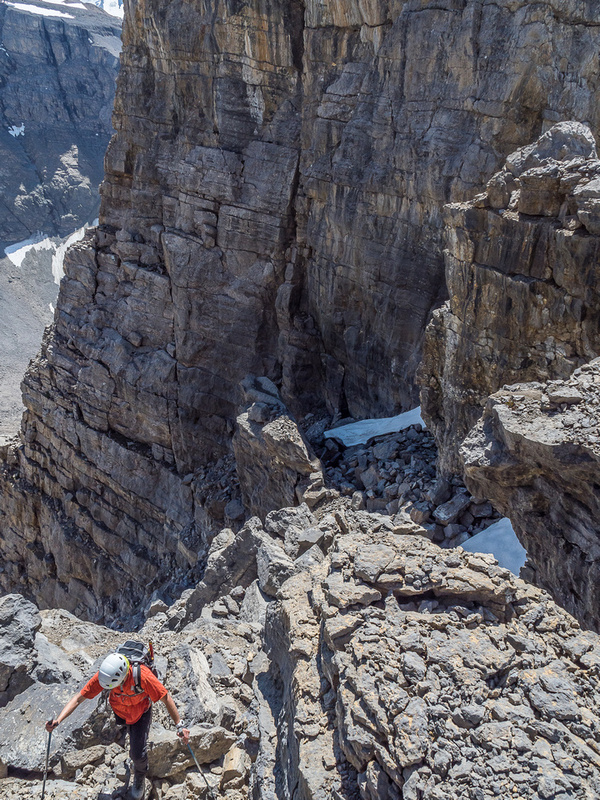 We gradually made our way back N on a snow slope and boulder field toward an obvious and seemingly impenetrable cliff band; however, there is a narrow couloir that breaks this cliff. 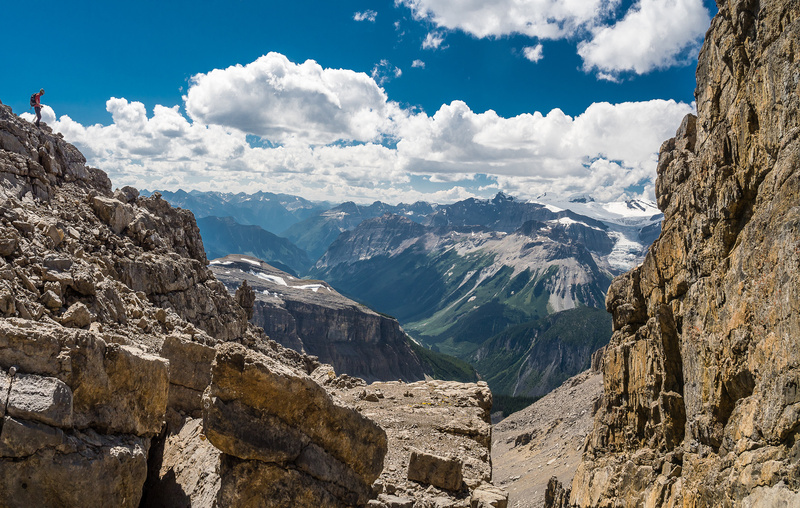 It is not an especially easy ascent – crampons and a couple of pieces of pro, even pitons, are advisable; it is particularly nasty when the weather is bad, the wind and snow whipping down this chimney like a hacksaw. I had been turned back on this ascent twice before I made it. Hmmm. That probably would have given me a lot more pause than “just” the idea of a 20+ km off-trail scramble did! It turns out that Rick probably could have made his life much easier if he’d just peeked around the corner a bit more, but we’ll get to that later. 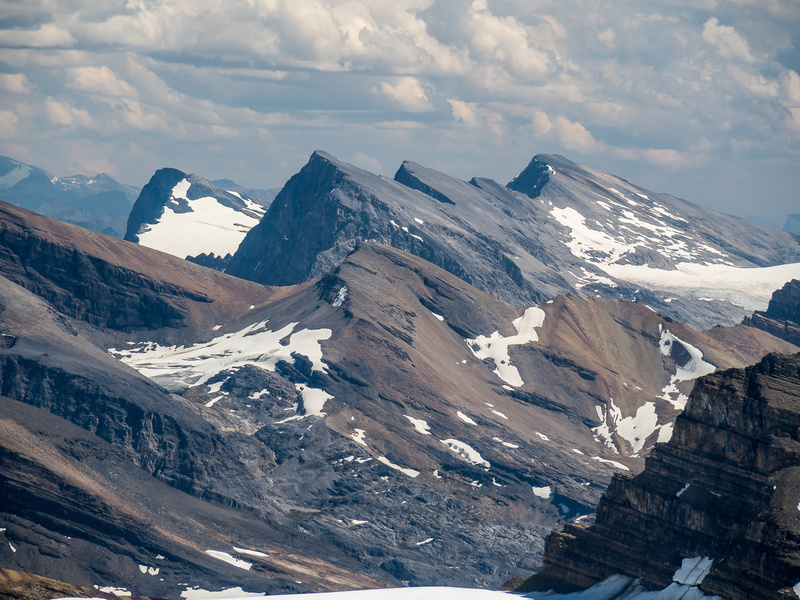 So, with the preface that I didn’t study this route too much in advance, it should come as no surprise to the reader that we decided to do it as a day trip from Calgary. We knew it was going to be long, so we did get up at 04:30, but on hindsight we should have slept at the trailhead on Thursday night – especially considering it literally starts at a campground. 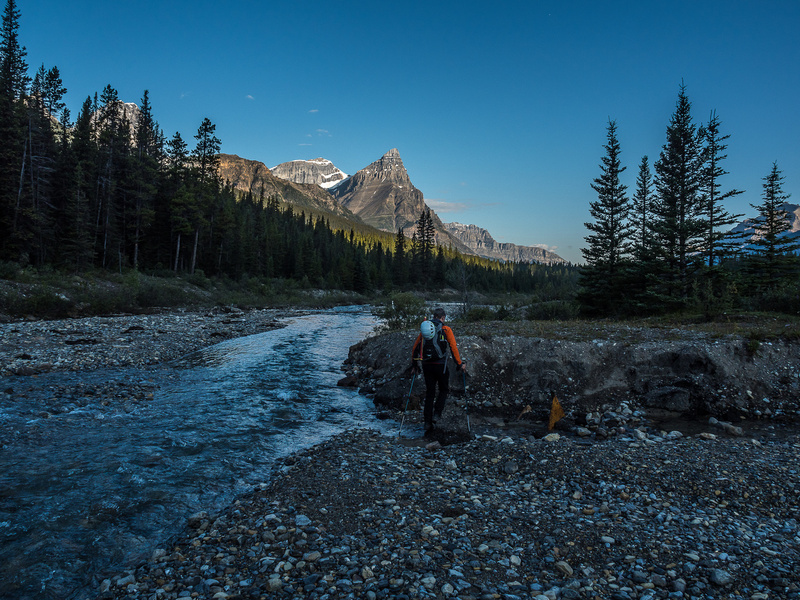 As it is, we arrived at the Silverhorn Creek Campground at around 08:00 and were soon geared up and ready to cross Silverhorn Creek and hit the bush leading to Mistaya Lake. Right off the bat, as we looked to keep our feet dry while crossing Silverhorn Creek, and started bushwhacking towards Mistaya Lake, I realized our misstep in not leaving earlier in the day. 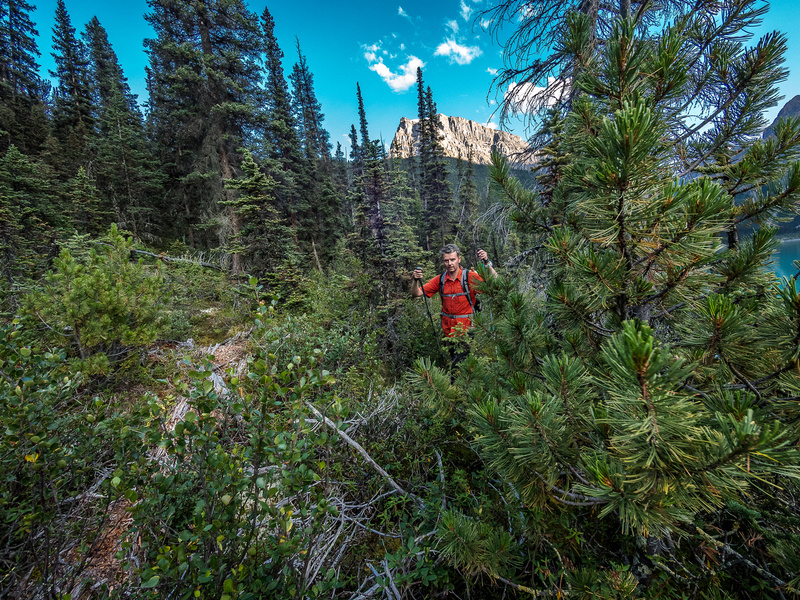 Off-trail trips take much longer and much more effort than trailed ones. We agreed but than shrugged and continued on. Thankfully, one of us remembered his head lamp. The other one remembered his crampons, so I guess we were even. 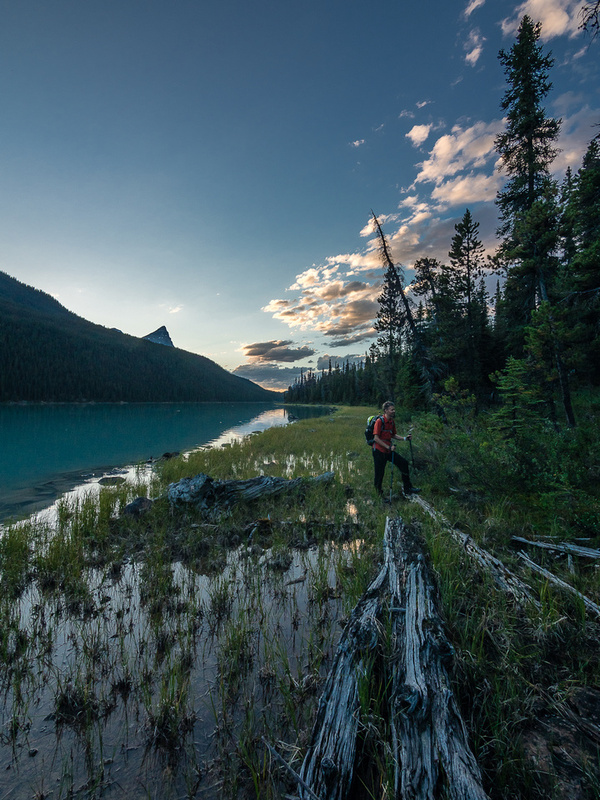 😉 After only around 500m of light bushwhacking we arrived at the eastern shore of the lovely Mistaya Lake, about half way down it’s length. Here’s where things changed from Phil’s October 2014 attempt. The water levels were obviously much higher now, in early August, and we were slowed considerably due to a partially submerged shore line. There were smatterings of an ancient faint trail in the low bushes and chaotic forest next to the water, but for the most part it was wet (morning dew) bushwhacking and rock / log hopping to avoid wet feet. 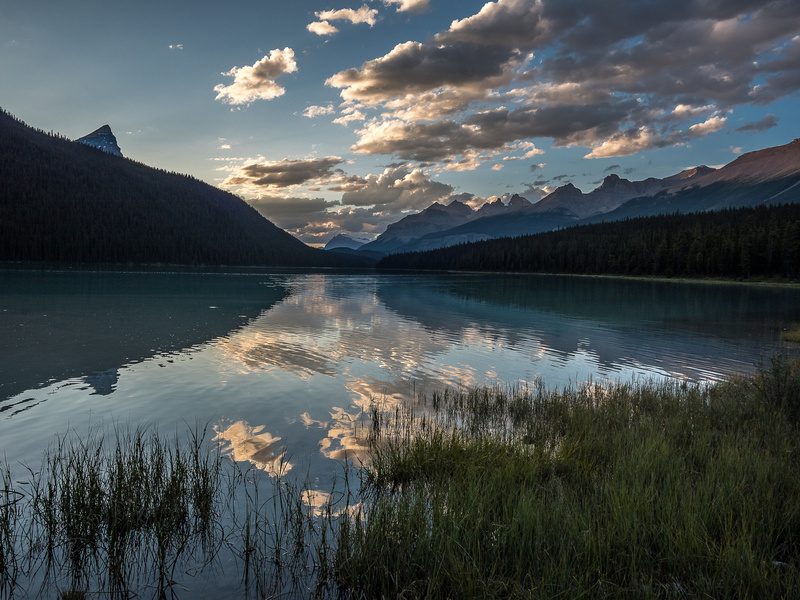 A lovely Mistaya Lake in morning calm. We have to somehow avoid getting our feet wet – note the submerged shore line at left – and make our way to the far end of the lake. Patterson looms on the left with Mistaya in the far background and an outlier of Capricorn Peak just right of center. An outlier of Aries rises on the right. Eventually we came to the Mistaya River’s entry point to the lake. Thankfully, this fast-flowing, glacial river splits into many channels right at the lake, making a summer crossing somewhat reasonable. Two of the 4 or 5 channels that we crossed were fairly fast and deep already in the morning. We wondered if they’d rise over the course of a warm summer day but figured we’d be fine. (I love how positive we always are in the early morning.) After crossing the last deep channel, I left my fishing waders behind and we continued thrashing our way along the wet shoreline to the back of the lake. 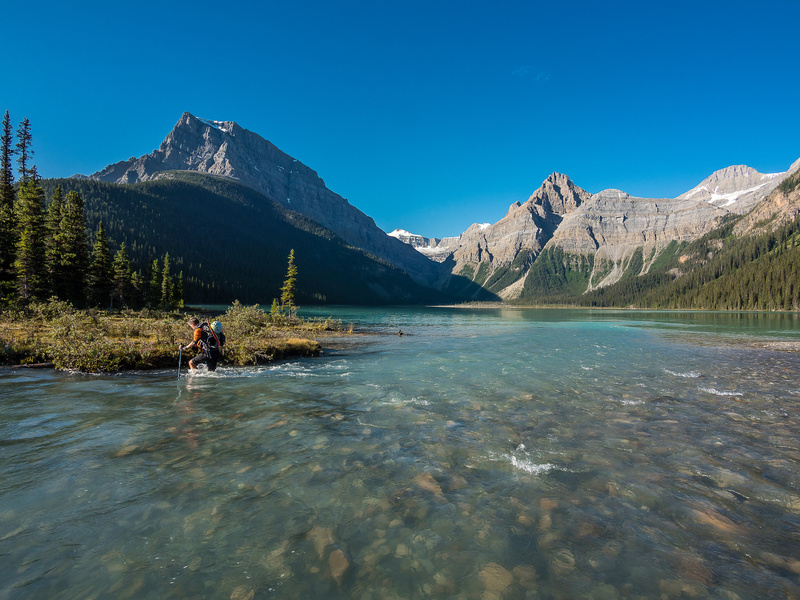 We cross another channel of the Mistaya River – again note how nice and clear it is early in the day! Immediately upon reaching a natural gravel berm at the back of Mistaya Lake my attitude towards the day became quite a bit more positive than it was earlier on the slow, soggy approach. 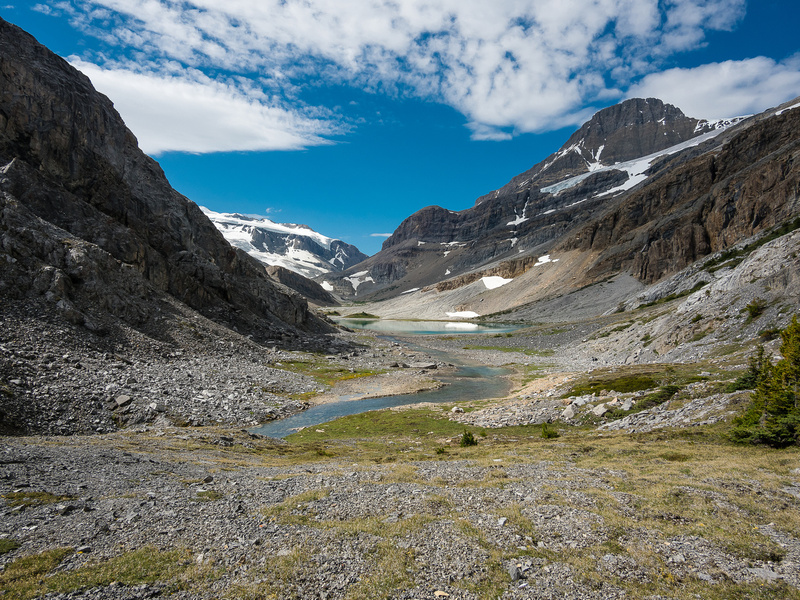 This place reminded me of one of my favorite places in all the Rockies and a gorgeous bivy site I used before climbing Mount Chephren – the gravel flats at the south end of Chephren Lake. 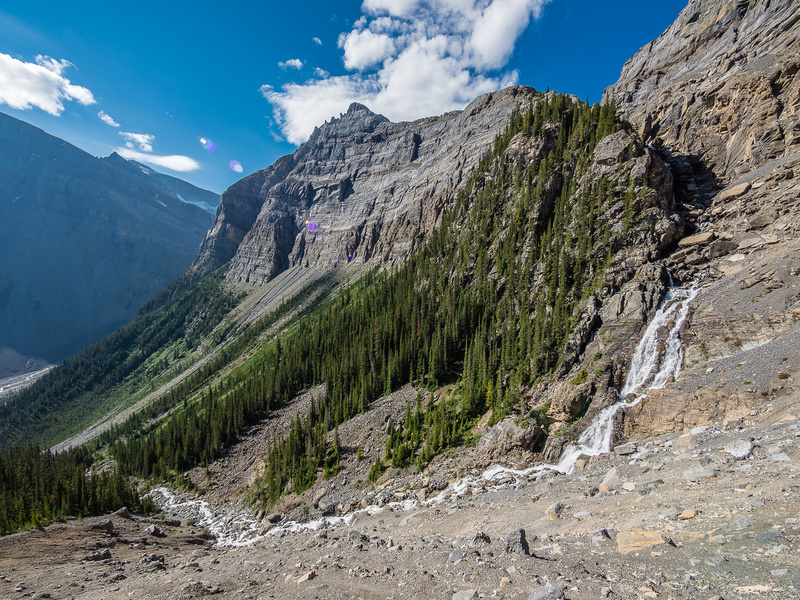 Waterfalls plunged loudly down to the valley ahead of us, culminating in rushing streams of various colors and intensity before reluctantly emptying themselves into Mistaya Lake. We crossed at least 2 or 3 of these smaller channels, working our way SW towards a raging Capricorn Creek and our steep access gully to the upper hanging valley hiding Capricorn Lake. 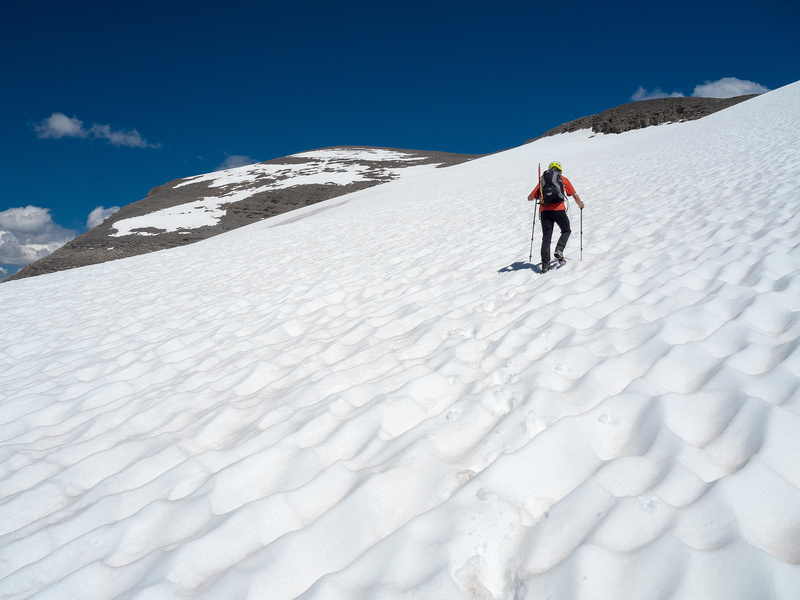 We bushwhacked a short way to an obvious avalanche slope that led upwards between Krumholtz on our left and forest to our right before ending at a large, steep scree slope leading to Capricorn Creek. 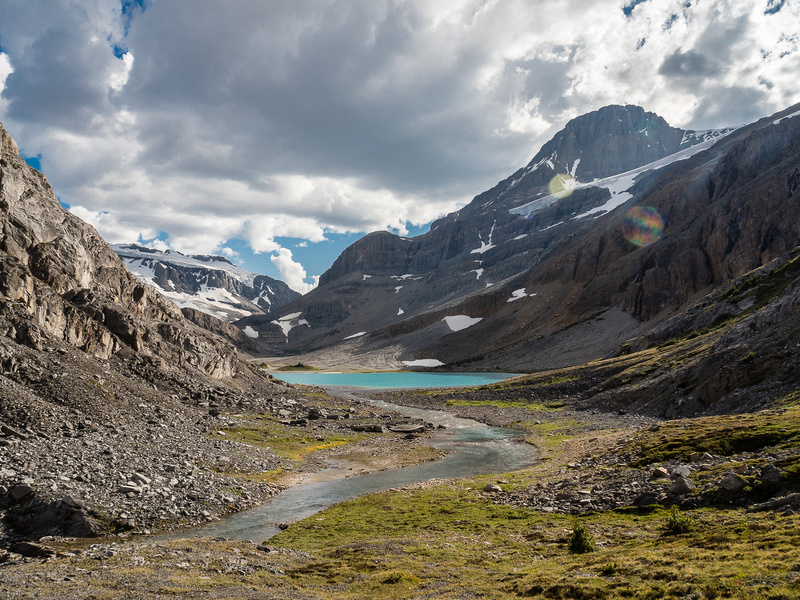 A magical spot at the back of Mistaya Lake where there’s a natural gravel berm and more streams entering the lake – from both the Barbette and Capricorn Glaciers. Collier mentions the slope leading into the Capricorn Creek gully as a major avalanche hazard when holding snow and I can see why! What Collier doesn’t mention and couldn’t have known, was that this steep slope isn’t really great without snow either. 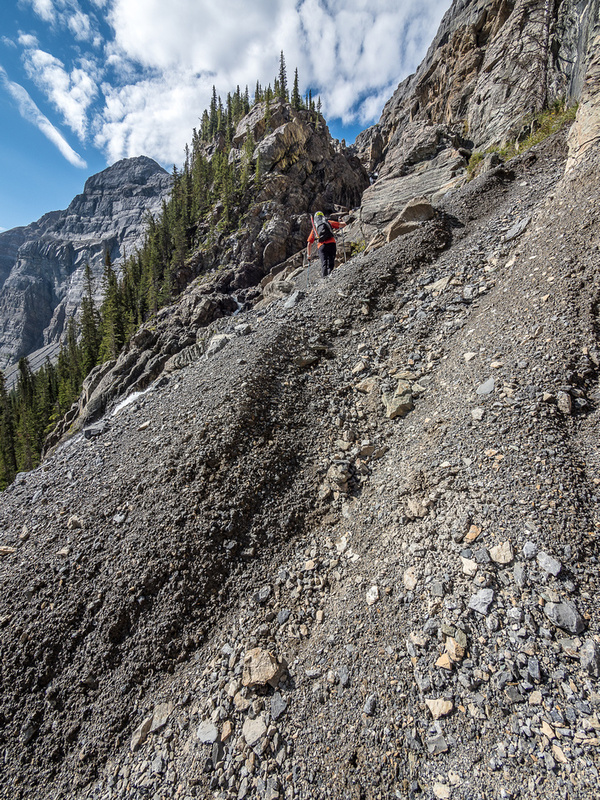 As happens more often on moraines, this scree slope was made up of hard, unforgiving embedded scree and dirt, rather than the more typical loose, annoying scree that we’re used to in the Rockies. 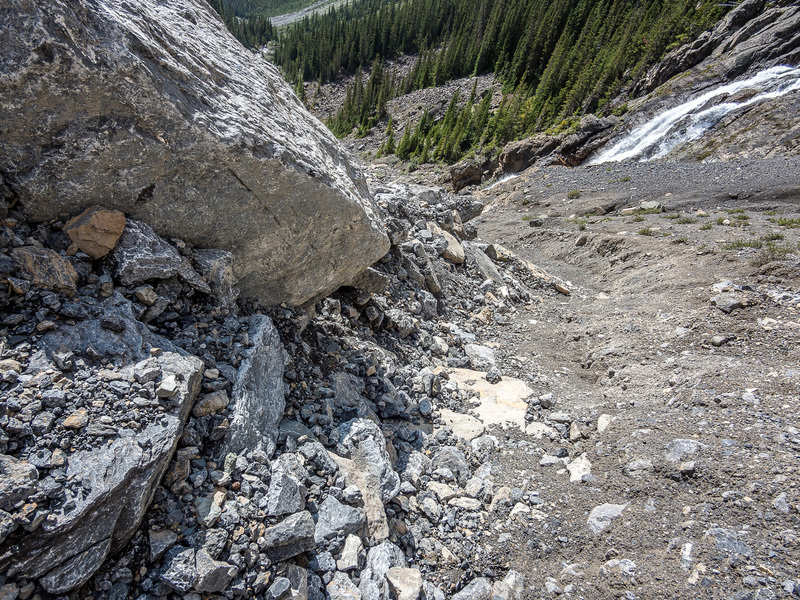 Loose scree might be annoying as heck, but at least you can cross the stuff without worrying about cheese-grating yourself down a 200m vertical slope into a raging creek because you lose what precious little purchase you can make with your mountaineering boots! 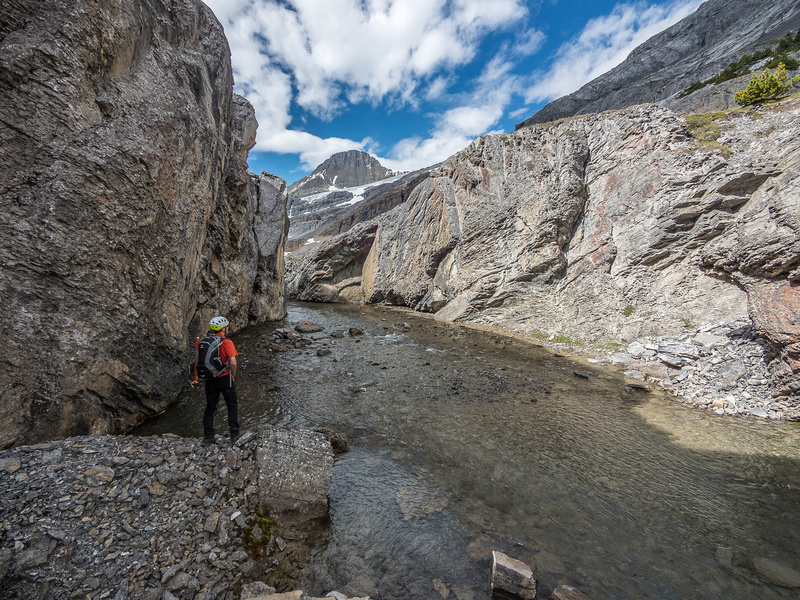 An incredible scene presents itself as we traverse concrete-scree slopes to the base of the Capricorn Creek gully. My shoulders hurt more than my feet at the end of the day, simply from gripping and leaning on my hiking poles so desperately while crossing the slopes towards the Capricorn Creek gully. Phil and I both thought that this was 1 of the 4 cruxes of our day, slipping on this slope would not be pleasant and it’s a distinct possibility with each tentative tip-toe across it. Once across the slope we weren’t home free as we had to carefully down climb a very steep and loose water worn gully with exposure to rock fall from above and to the creek far below. After finally crossing the annoying scree slope and steep gully, we entered a pretty special place. 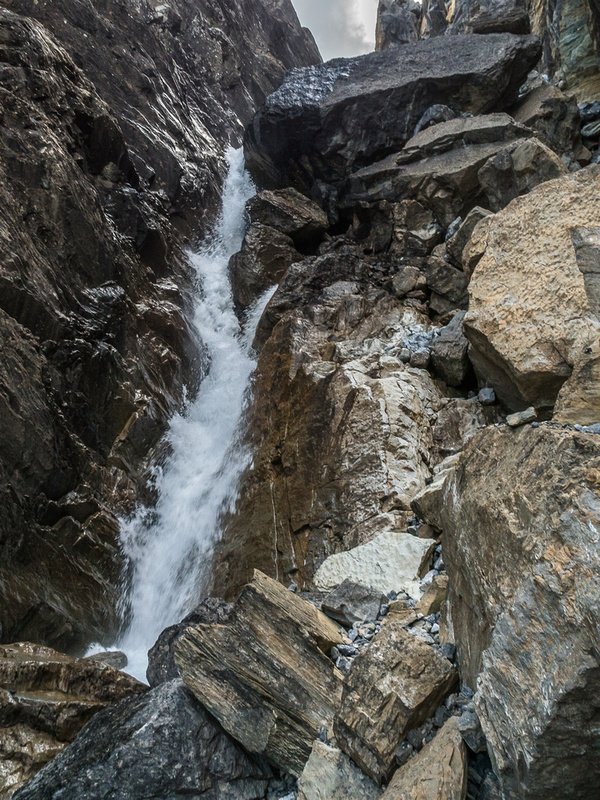 Capricorn Creek plunges down a hidden gully from Capricorn Lake, resulting in rushing waterfalls and raging rapids on its way down hundreds of meters to Mistaya Lake below. Our access route would climb right beside the raging creek all the way up to the lake! Here’s where the 2nd and 3rd cruxes of the day were encountered. We clambered up the steep gully on very loose and sometimes wet terrain, taking great care not to knock boulders or rocks down on each other (I would not even think of doing this approach with more than 1 or 2 people). Phil looks pretty small in the lower Capricorn Creek gully. 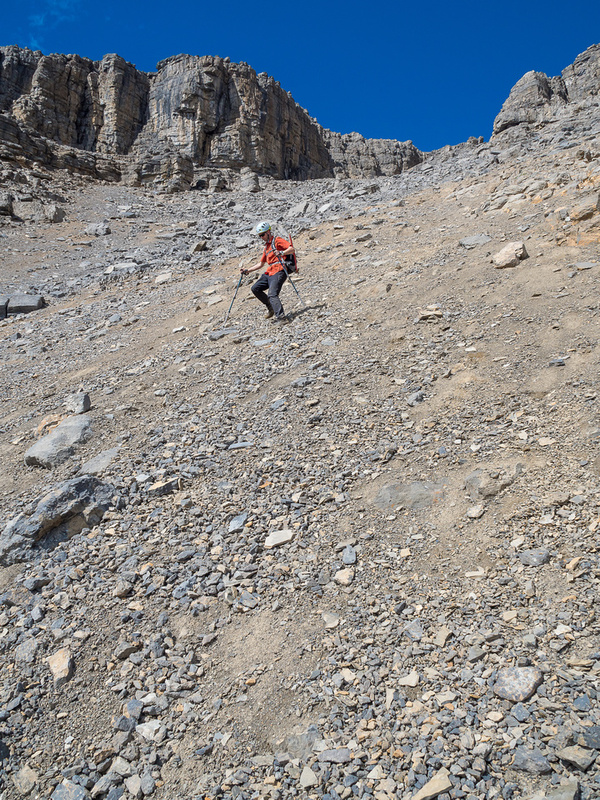 Again – notice the incredibly loose terrain above him here. The huge boulder and crux #2 is visible at upper center – the chockstone isn’t visible but it’s right of the boulder. About 1/3 of the way up the gully, after clambering up and over some moderate and slick terrain beside the raging creek, we encountered crux #2. 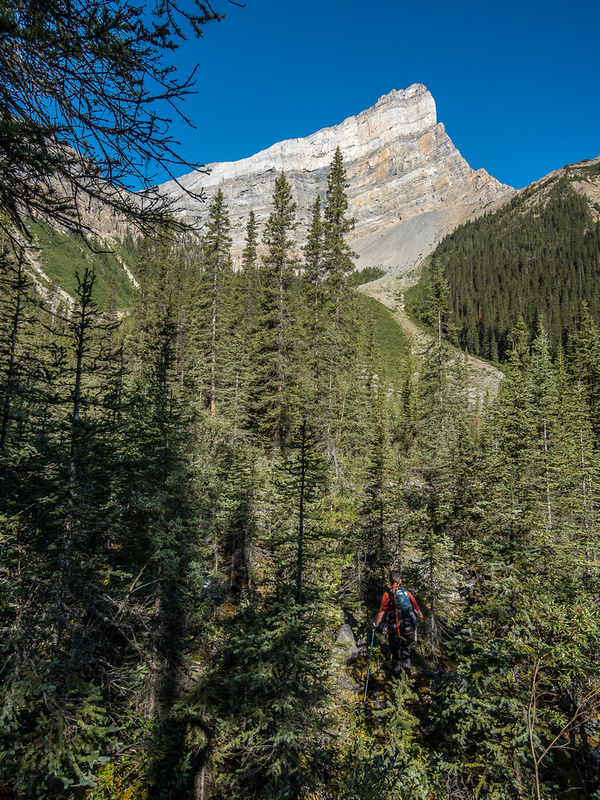 The gully has certainly changed since Rick did it – for sure the 2013 floods would have cleared out a lot of the loose stuff, but it even changed in the two years since Phil first climbed up it. Crux #2 is a huge boulder which spans across the gully next to a raging waterfall and only allowing a small boulder / chockstone to grant any obvious access next to the wall on climber’s right. The problem? This ‘small’ boulder is still plenty big enough to do serious damage if it pops loose and it’s very precariously balanced on rock debris. On ascent both Phil and I managed to wedge a knee and gather enough courage to boost ourselves up and over this crux, but I knew right away it was going to be an issue on descent and it stayed in my mind most of the rest of the day. Just to verify it’s low 5th difficulty, I noticed a busted bolt right above this section. 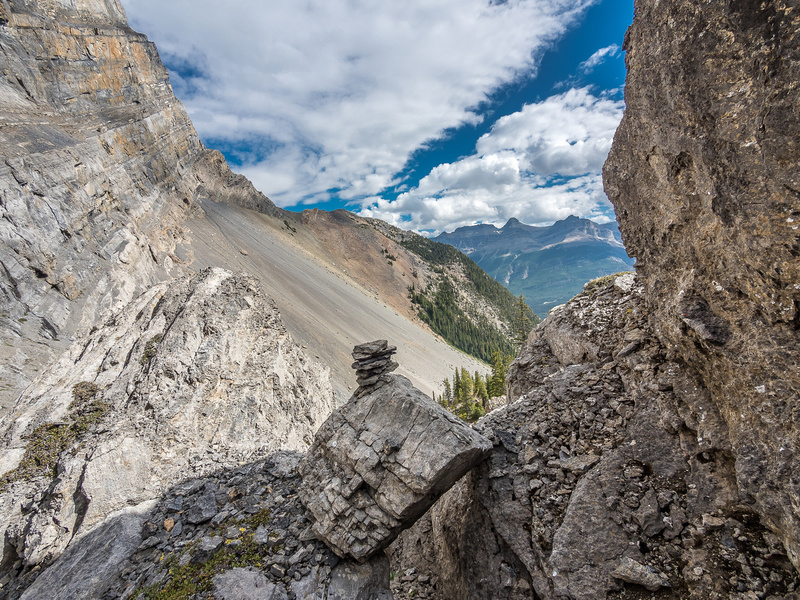 Gorgeous scenery in the gully – this is where we crossed to climber’s left to continue upwards. We’ve now crossed the raging stream and are climbing up to the third crux. Once we were above the ledge traverse we still weren’t done with tricky terrain. 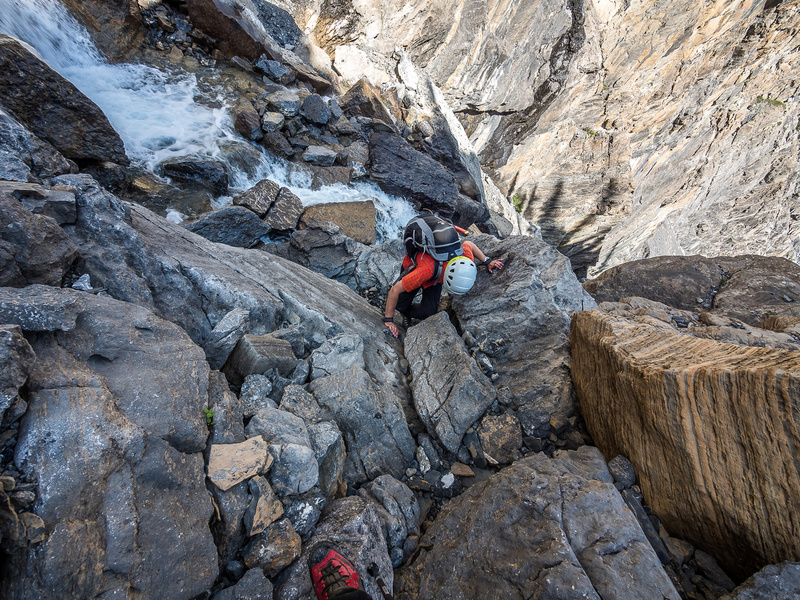 Sticking on climber’s left of the creek we traversed high above it on loose scree, slabs and scree-covered slabs before finally we were looking down on the outlet stream of Capricorn Lake, just before it plunges over the lip of the gully. We descended to the shallow water and managed to cross to climber’s right side without getting too wet, before ascending a short scree gully and finally breaking free of the ascent gully with stunning views towards Capricorn Lake including Parapet Peak on the left and Breaker Mountain straight ahead. The next few hours were pure hiking magic. 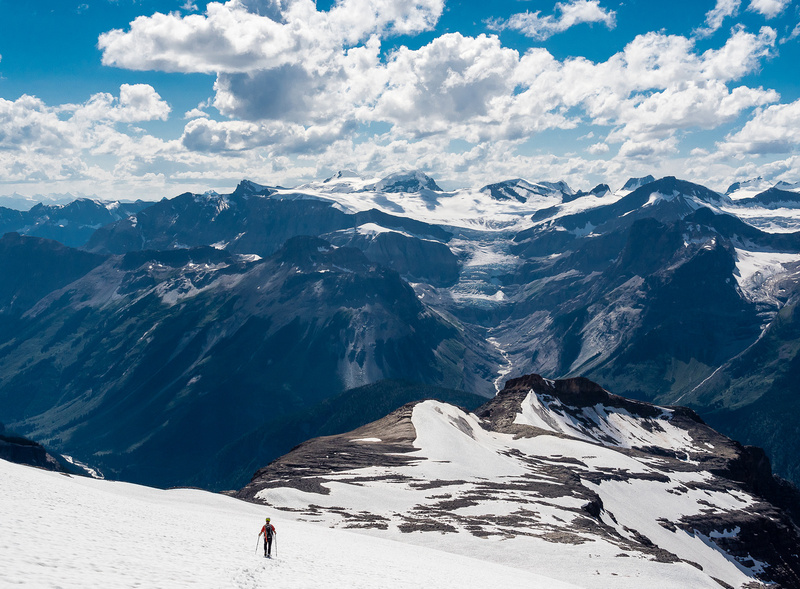 Honestly, I don’t know why I forget the delights of hiking in the high alpine where few human feet have gone before. 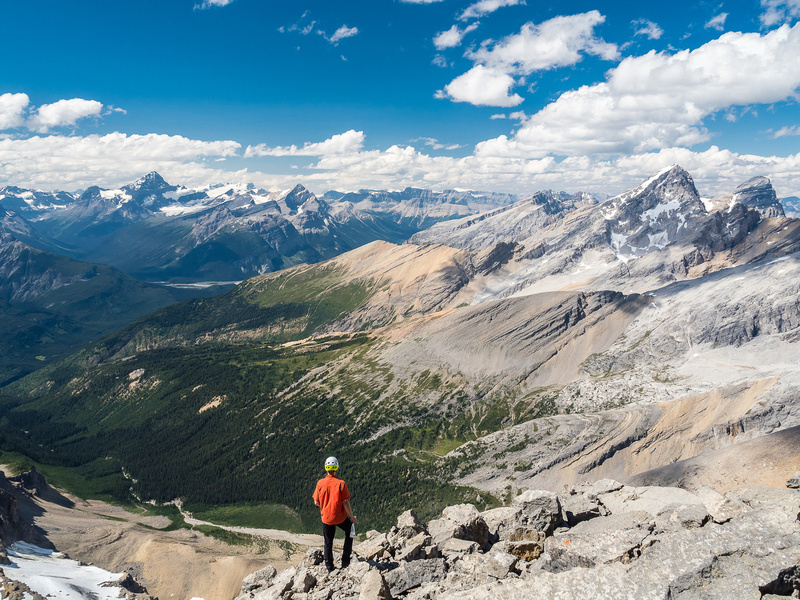 I always seem to get distracted by the idea that any of these mountain pursuits that we do actually mean anything and I forget what hiking and scrambling for the pure joy of being in a wild, spectacular landscape is all about. Well, I’ve been reminded! Hiking around the sublime Capricorn Lake was easy and quicker than I expected. The next section to the Parapet / Breaker col was also fairly easy, but took longer than I first surmised. We started climbing newly uncovered moraines where the maps still indicate glacial ice, and passed several lakes and tarns along the way. I wonder how many years ago this terrain was covered in snow and ice? I’m thinking when Rick did it in 1987 part of this area was still glaciated. 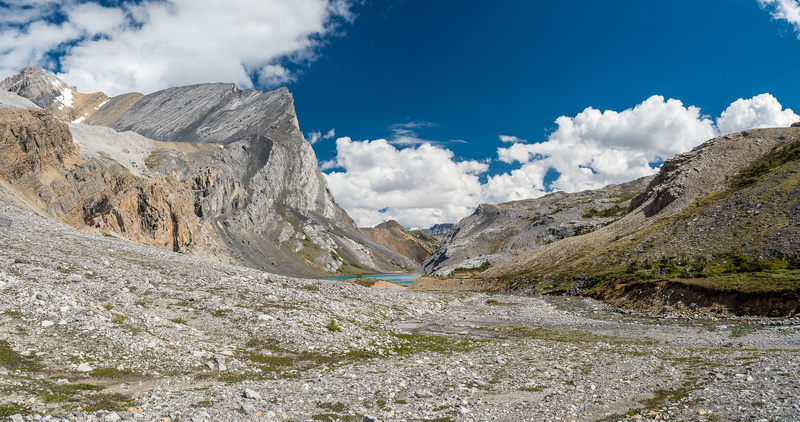 This is looking back at Capricorn Lake after hiking alongside it. An outlier of Aries on the left and unofficial “Capricorn Peak” on the right. As far as I’m concerned anything past this moment was a bonus. As we worked our way past a muddy Parapet Tarn and towards the col, we started glancing up at the south end of Breaker – looking for a route through the line of cliffs skirting the upper mountain. Alas, there was no obvious break. 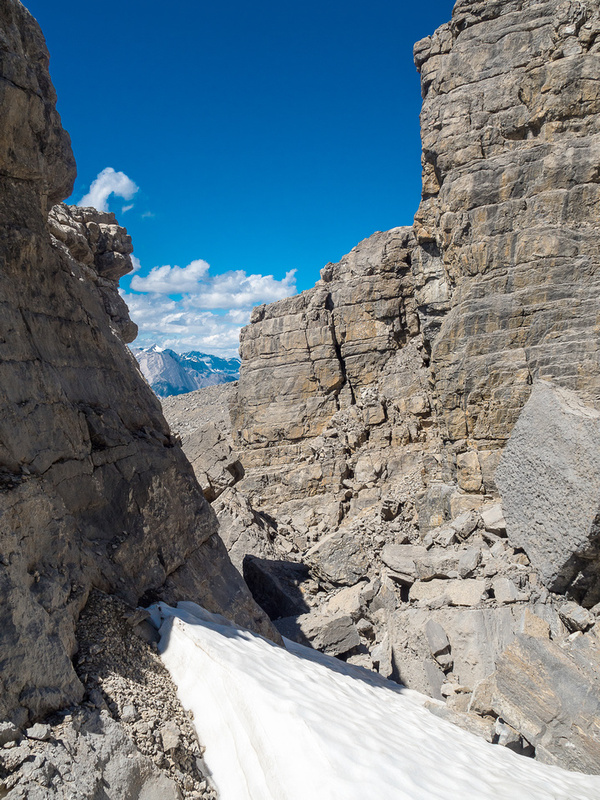 We slogged up very loose, bouldery scree to a small pile of the stuff, just over the col to eat some lunch and figure out what to do and where to go from there. 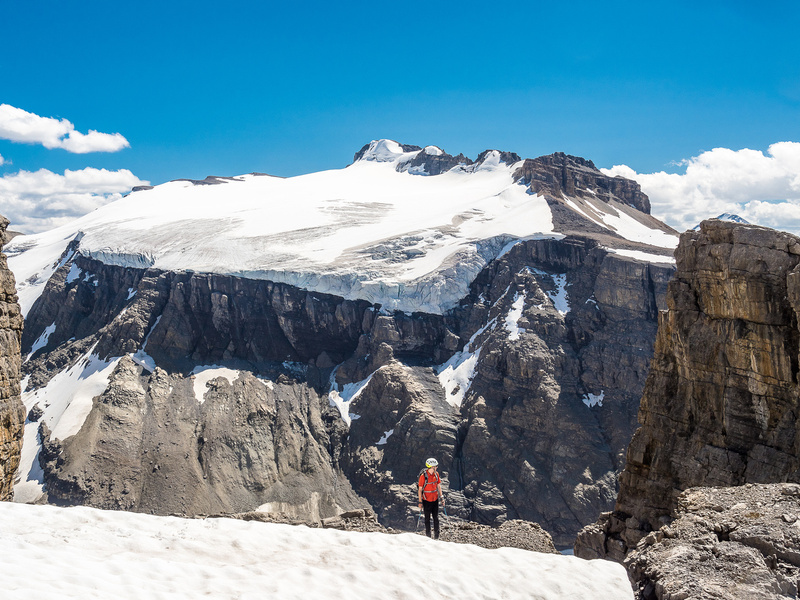 We could already see that our views of the Mummery Icefield were about to become pretty impressive, as were the views southeast to the appropriately named (unofficially) “Parapet Peak”. From our perch on a pile of scree and small boulders, we could clearly see one possibility for breaking the cliff bands on the upper mountain to the north. A steep chimney split the cliff band next to a couple of other, much less friendly looking cracks. But this seemed a bit more than moderate scrambling to my eye – and remember, I was still naively thinking that at this point we’d finished all cruxes for the day. 😉 There were two other options – neither of which were appealing. We could try to traverse further around the south and west slopes to check out that terrain or we could try ascending alongside the cliffs on the close side (south) and hope there would be a break higher up (this is what I think Rick did). The day was already looking to be much longer than we’d expected, so traversing further around to the west wasn’t filling us with excitement. 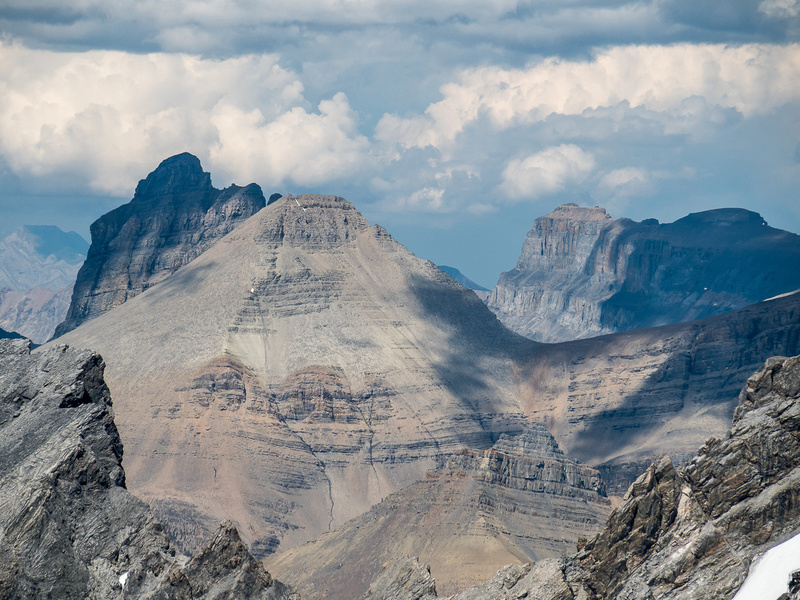 We also didn’t love the idea of a “hail Mary” directly up to the south ridge which would likely mean tons of elevation gain for one, unlikely shot at getting lucky. In the end it only really made sense to go for the obvious route – the large break in the cliff band to the north of our position via a broken chimney. I led the way up and across loose / hard (!) 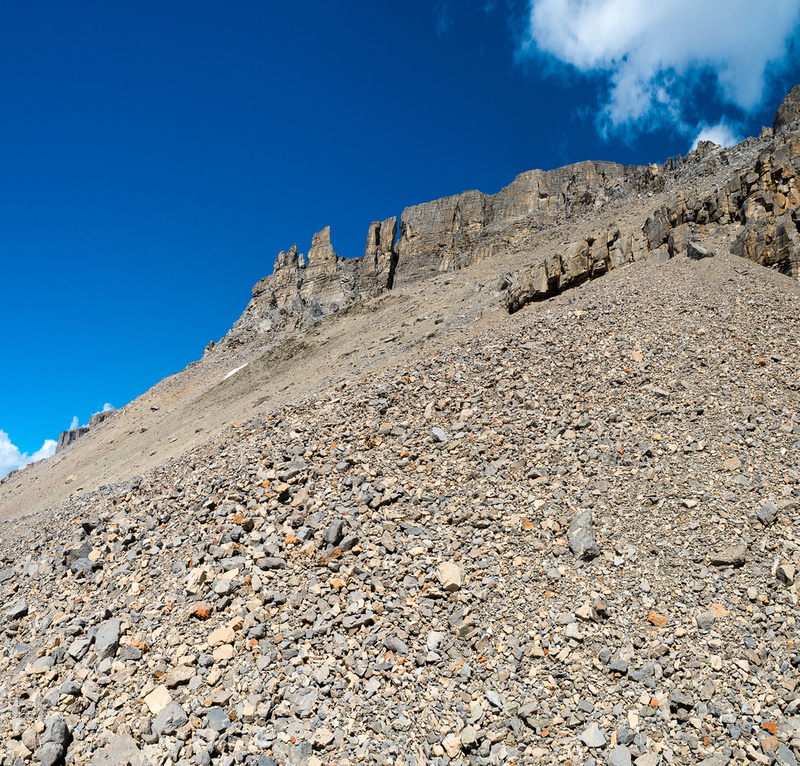 scree slopes to the base of the crack. 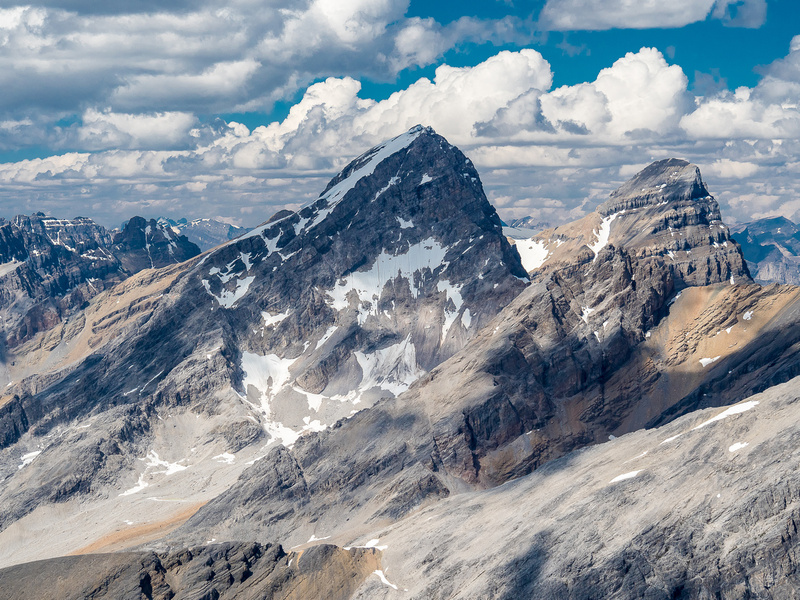 As I got closer and closer the terrain started looking tougher and tougher until I was staring up at giant chunks of loose Rockies crap, leaning towers of crumbling rock and huge rock crevasses between them, threatening to swallow up and spit out anyone who dared enter. Getting closer to the chimney (L) and starting to think it might be harder than it looked from afar. Looking down the chimney as Phil enters it from below. Great care was needed here not to knock rocks down on ourselves or each other. After breaking through the top of the chimney I could clearly see that we weren’t through the cliff band just yet. 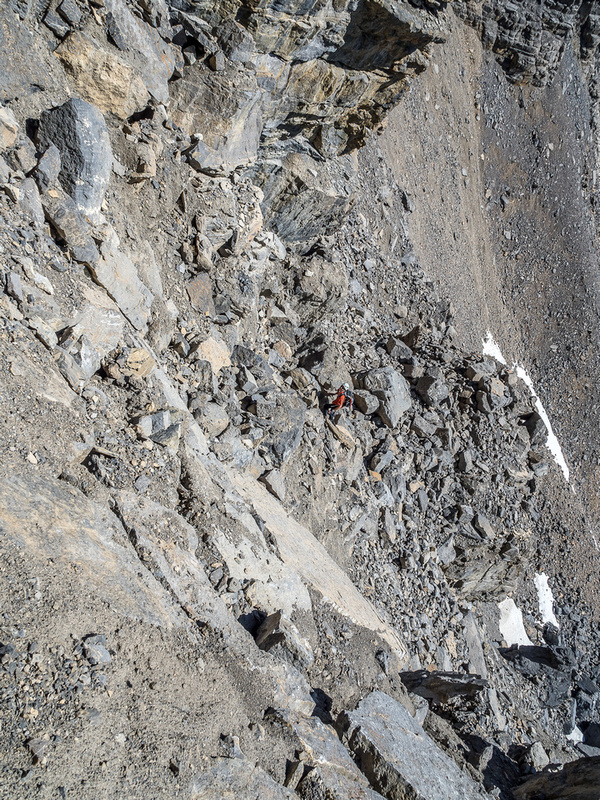 🙁 The only option at this point was traversing some more broken terrain towards a promising looking scree ramp that would hopefully brake through the bands to the north of our position – on the west face just like we’d suspected might happen. 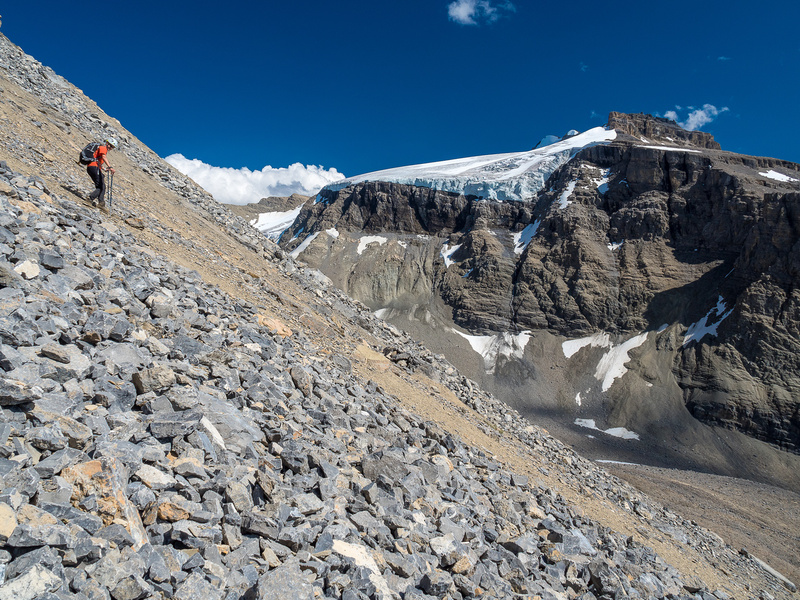 There were a few more nervous moments while we traversed large, blocky terrain but as the upper part of scree gully finally came into view we could breathe a huge sigh of relief! We were actually going to get through the darn cliff band! FINALLY. 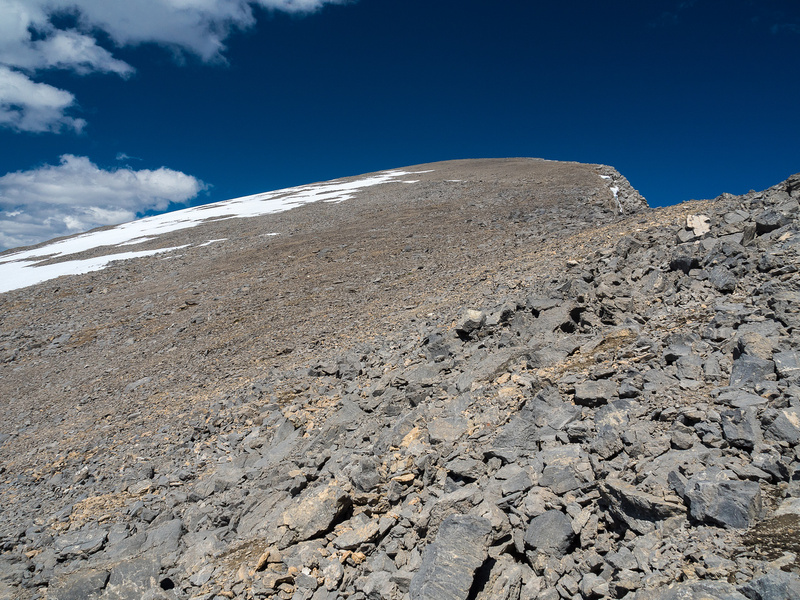 There wasn’t a ton of room, but the scree ramp led nicely up through the steep rock and we found ourselves at a large patch of snow / glacier leading up towards the summit. I took a quick glance at my GPS and was a bit dismayed to find that we were still 1.5km from the top, but at least the terrain looked very non-technical from here. We just needed the energy to trudge up the rest of the dang mountain! Phil breaks out of the chimney with Parapet Peak rising dramatically behind him. Phil led the way slowly up to the 10,033 foot apex of Breaker Mountain. It was a bit depressing to realize how slowly we were moving for the final 1km but finally, after 7.5 hours of hard hiking and scrambling from the parking lot we were standing on the summit! It was a great feeling to realize that with very little beta (none from a summer ascent) we had managed to find a route up this peak. 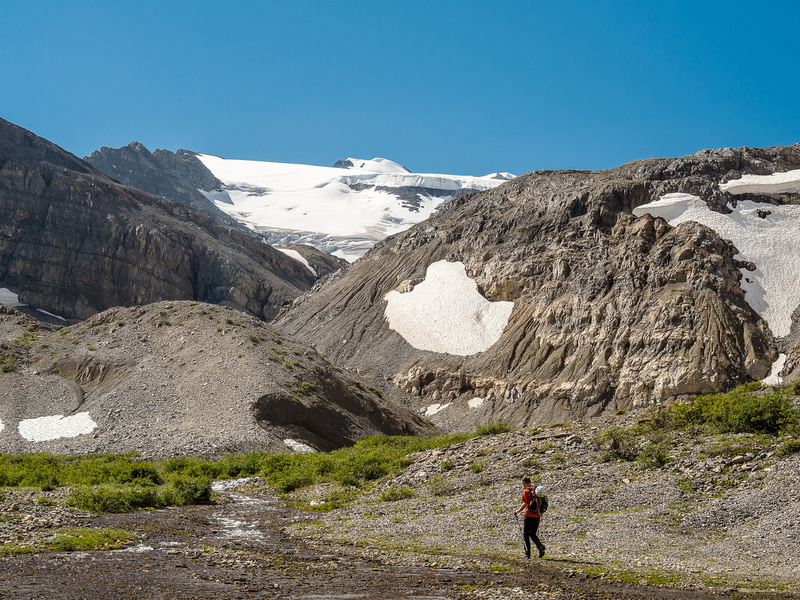 The views in every direction were stunning and included everything from the Wapta Icefield to the south to the Mummery and Freshfield Icefields to the west, to the Lyell and even Columbia Icefields to the north! Recondite and Willingdon were visible to the east. 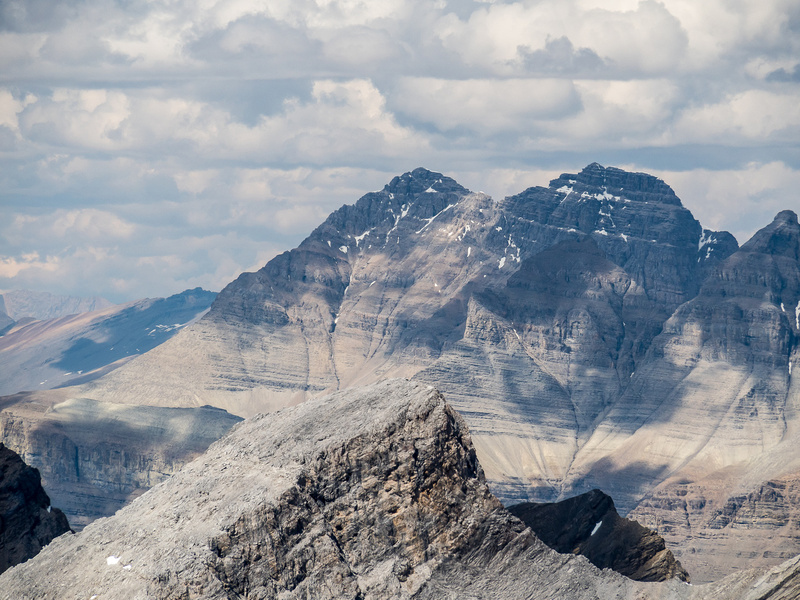 Even though the western flanks of Breaker looked to be fairly easy to ascend – accessing these slopes would require some pretty remote terrain and would still not be easy – certainly not a day trip from Calgary! With the Blaeberry Road being out of commission that approach (from BC) would not work and approaching via the Howse Pass decommissioned trail would be ‘interesting’ to say the least. More incredible views east and south from the summit including (L to R), Howse, Chephren, Murchison, Corona Ridge, Noyes, Weed, Silverhorn, Mistaya Lake, Capricorn Lake and Mount Patterson. Our start point at Mistaya Lake (C) is a LONG way from here! 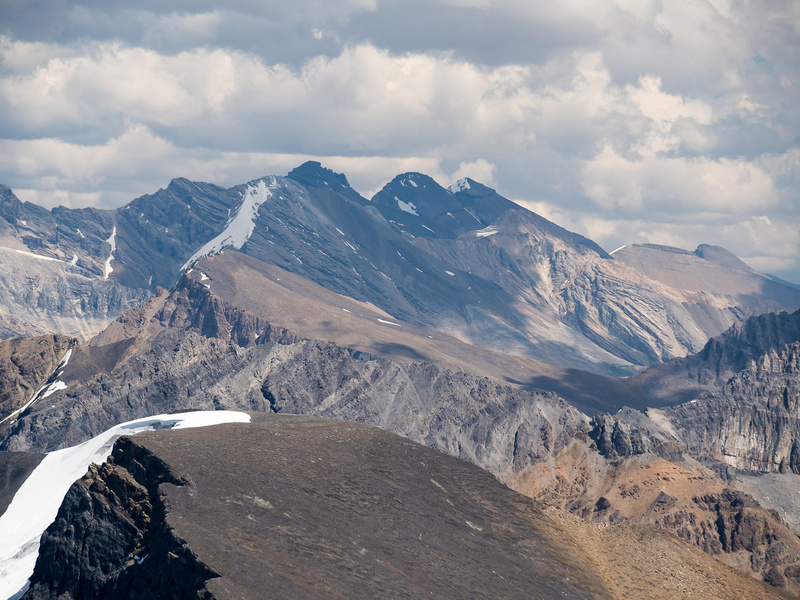 A myriad of summits around the Wapta Icefield includes (L to R), Caldron, Jimmy Simpson, Crowfoot, Thompson, Mistaya, Peyto, Temple, St. Nicholas, Olive, Gordon, Balfour, Barbette, Habel, Trapper, Parapet, Baker, Collie, Ayesha, President, Des Poilus and even Vaux in the far distance to the right of Des Poilus! Mount Patterson at left with Parapet at right. We searched hard for a register in and around the summit cairn but could not find anything or any signs of one. We had anticipated this and brought our own Nalgene register with all the summit accounts we knew about (the Boundary Commission, Don Forest’s party and Rick Collier’s group) – adding our own 2 cents before rebuilding the cairn. One curiosity that we found tangled in rocks at the summit, was a lengthy piece of white plastic material about 20ft long and 4ft wide. It was obviously very old and we had no idea what it could possibly be. Good thing I lugged my 55 liter HMG pack on this trip, because I needed every bit of that 55 liters to fit the garbage and my own gear! I wasn’t too happy about adding all that weight to the long descent ahead of us, but I didn’t really have a choice as leaving that garbage on this pristine place wasn’t an option either. After enjoying the summit views for 30-40 minutes it was time to start our long descent. 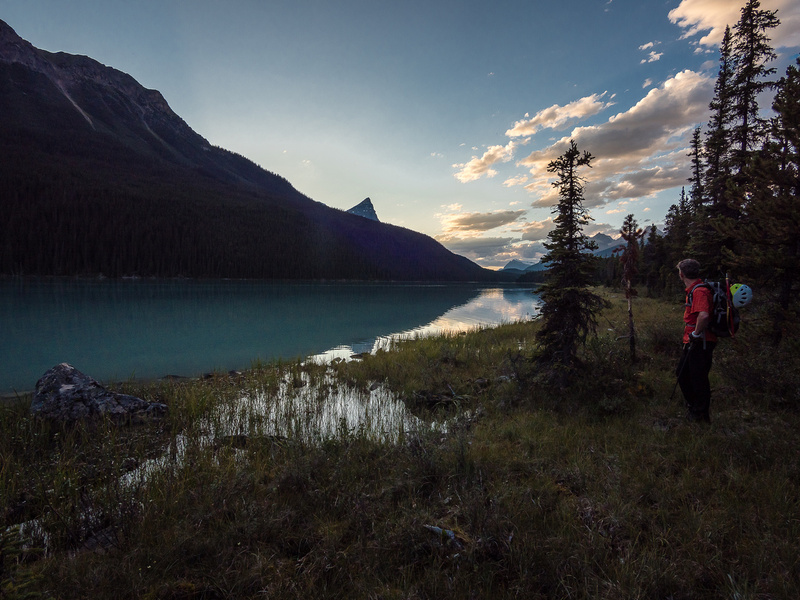 We knew at this point that we’d be much later than we originally anticipated and wanted to get down to Mistaya Lake before dark if at all possible. With only one headlamp (?! 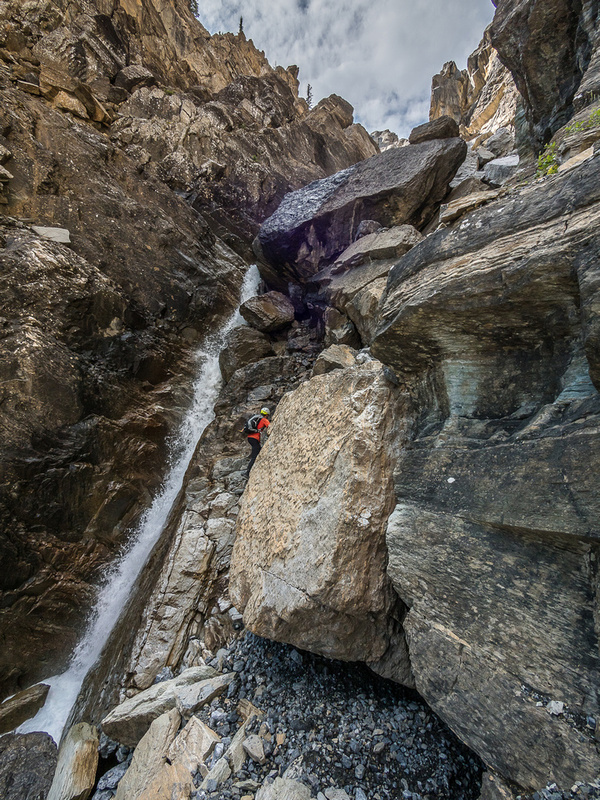 ), the steep access gully would be almost impossible to navigate in the dark. The first order of business was bypassing the 4th ascent crux – the loose chimney – by traversing further around the west and south scree slopes of Breaker towards the Parapet / Breaker col.
One of my favorite shots from the day showing Solitaire Mountain looming far above green valleys and rushing streams below its impressive east face. 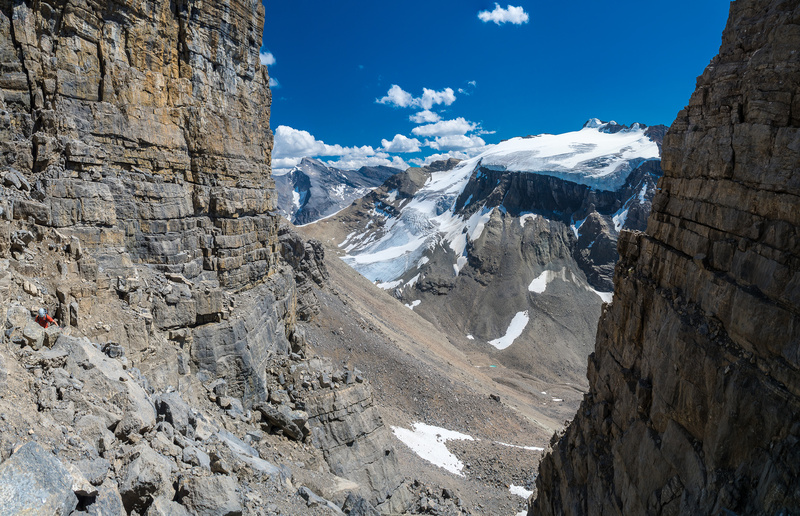 Once we finally made it to the Parapet / Breaker col we were feeling pretty thirsty and tired so without any hesitation we pushed on towards Capricorn Lake and our exit gully. The late afternoon / early evening lighting added to the special landscape and helped to dull the various pains that were flaring up in my body at this point! As we approached Capricorn Lake we noticed some white dots at the shoreline. Sure enough! 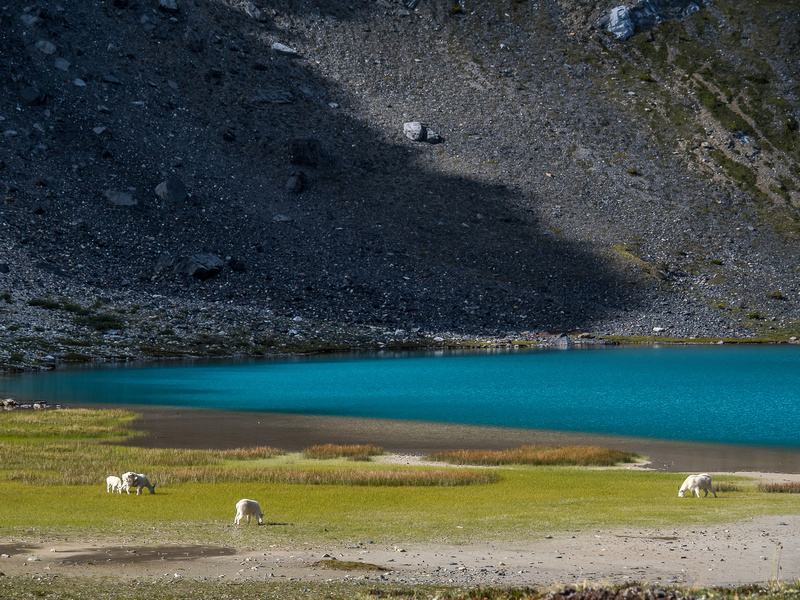 A small group of magnificent mountain goats were grazing alongside the brilliantly colored waters of the lake, enjoying a pristine solitude that I’m sure is rarely – if ever – interrupted. We felt really bad about disrupting their peace but we had to go right along the goat’s path in order to continue our descent. 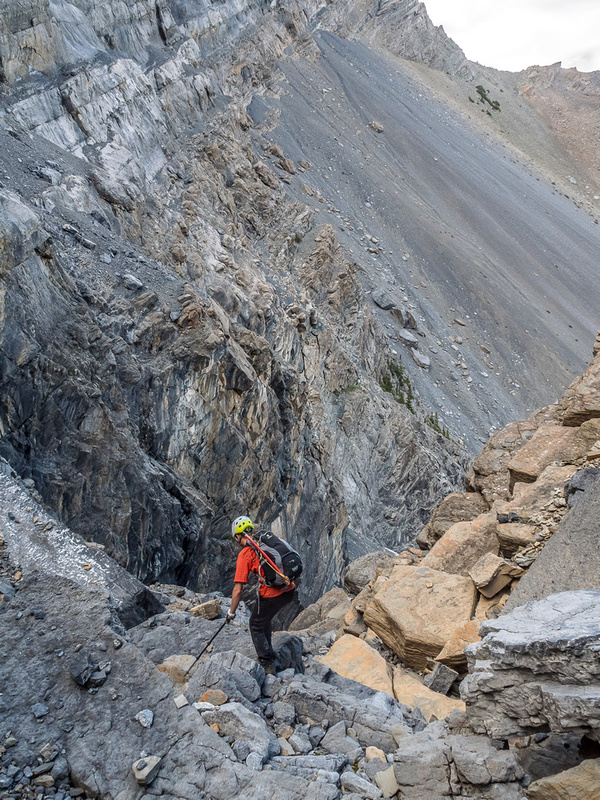 The goats eventually scrambled up a terrifyingly exposed cliff towards Aries Peak (how appropriate is that) while we skirted between them and the lake and made our way to the top of the escape gully. 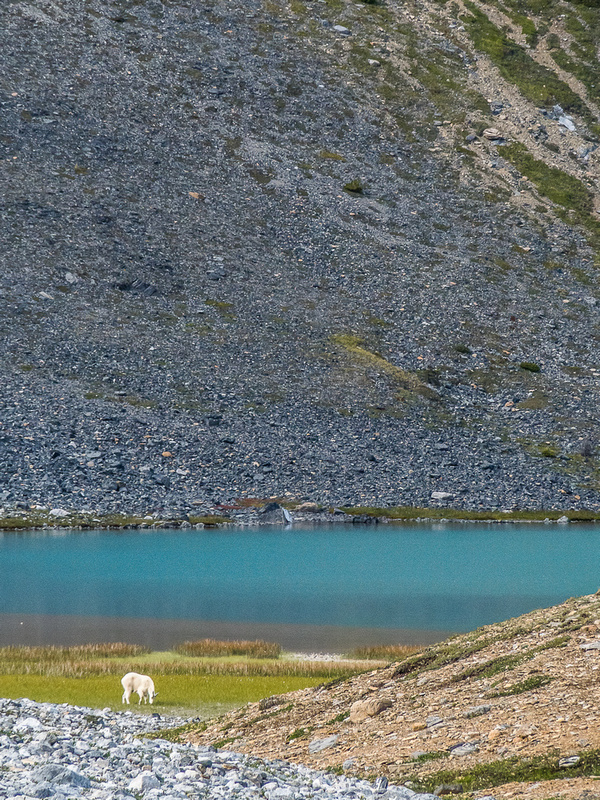 One of my favorite Rockies animals – a gorgeous mountain billy goat grazes near Capricorn Lake. As we re-crossed Capricorn Creek, just before dropping into the steep gully, we immediately noticed that the water level was quite a bit higher than it was that morning. Uh oh. If water levels were noticeably higher here already, what about the Mistaya River crossings far below? I guess we’d find out! 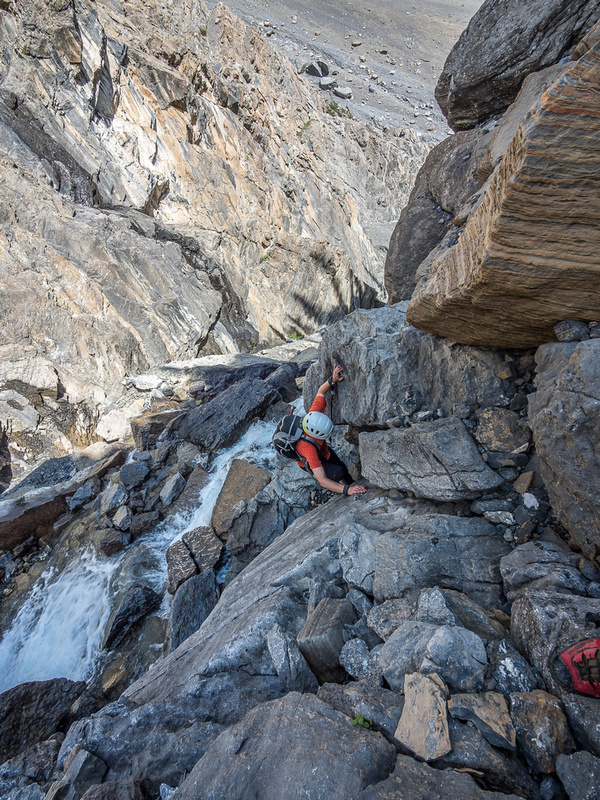 We worked our way carefully down to the ledge traverse crux. The key to this crux was a stem move to get onto the ledge. After that it wasn’t too bad and soon we were crossing the creek – again the raging creek seemed a lot fiercer than earlier! A wet down climb from the morning was actually running water at this point! We had to sit down while descending it in order not to slip off the wet rock. Wild scenery as I glance back one last time at Breaker Mountain rising over Capricorn Lake. 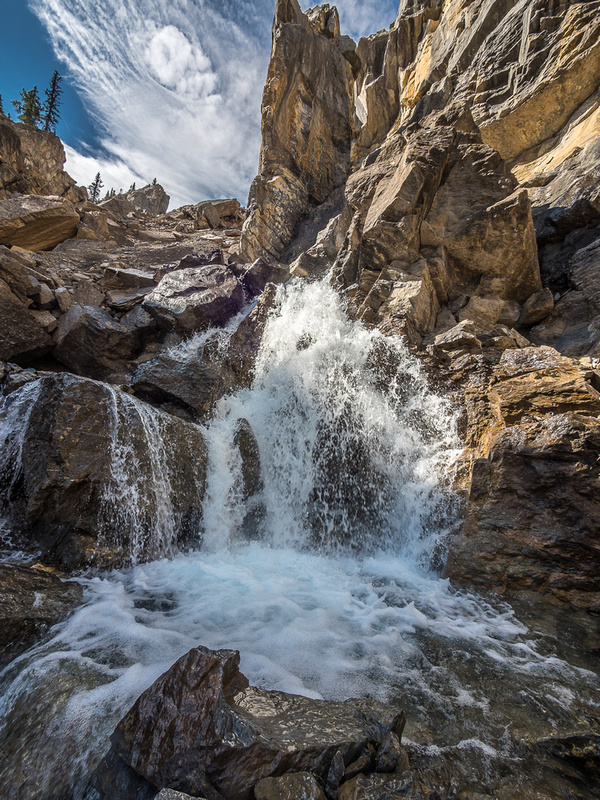 The creek itself was a nonstarter as it was a raging waterfall around the huge boulder and next to a cliff. There was one other option that didn’t look possible at first, but as I thought about it, it started to look better. Funny how that works. 🙂 A wet, diagonal, flaring crack ran down the huge blocking boulder that didn’t look too exposed. I wondered if I could stem down this crack and drop out of the bottom of it without breaking anything. Phil wasn’t convinced, but I shrugged out of my pack and started down, carefully trying to keep friction on the steep / wet rock. Thankfully it worked beautifully. 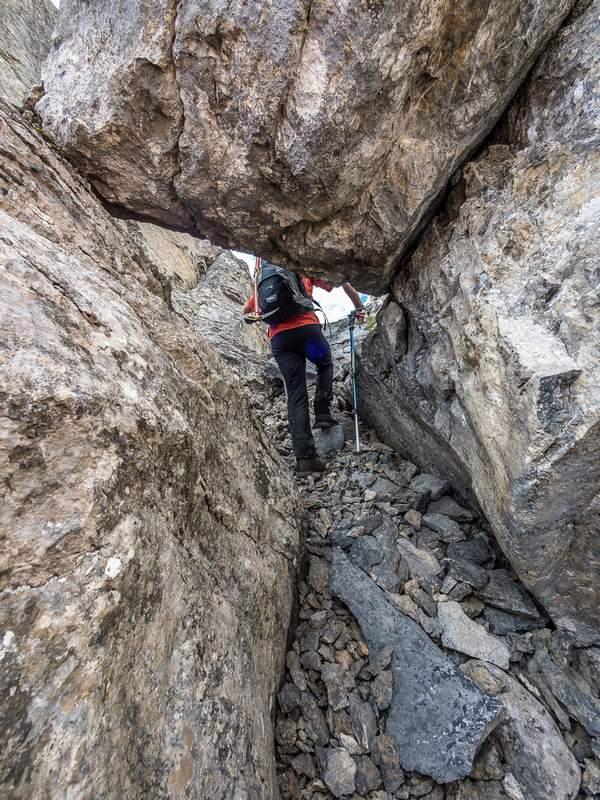 It would be tough to ascend this way due to the slick surface of the rock, but for descent it was far better and less dangerous than pulling hard on a questionable boulder-hold! Phil handed the packs down to me before descending the crack himself without incident. Phew. 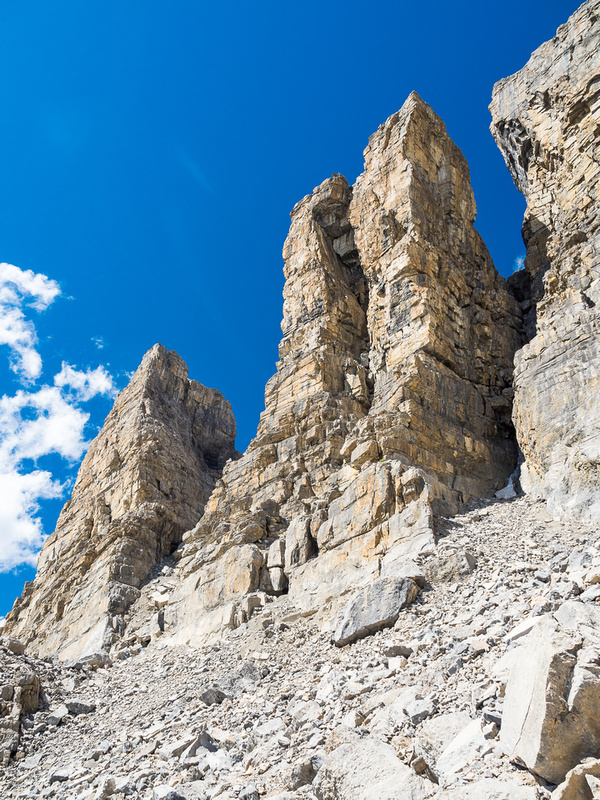 Now only one more crux awaited – the nasty concrete scree slope high above Capricorn Creek. 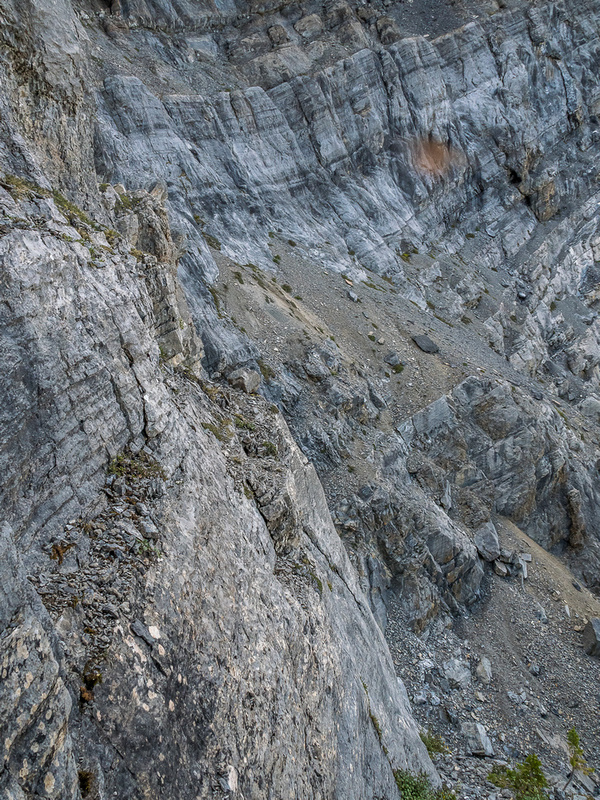 As we exited the gully we tried to find an easier line across the first crux of the day and now the last. 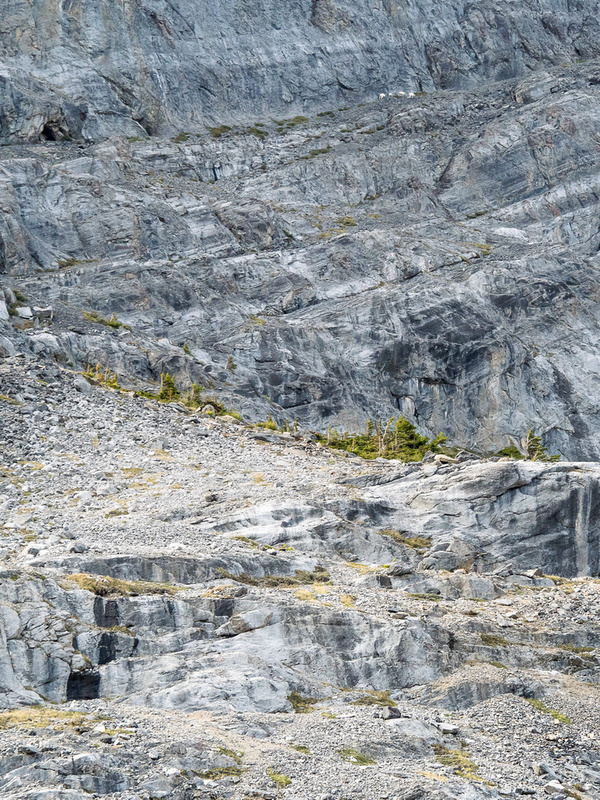 The concrete scree slope looks so innocent on photographs and even from up close. It’s only when we were 100m traversed onto it that we started thinking that this wasn’t so much fun anymore. 😐 We picked a lower line than on ascent and went for it. It was no better than the morning’s route. Basically there’s nothing to do on this slope but delicately edge your way across it. Hopefully you have poles with you, because without them it’s going to be very spicy. Think “cheese grater” if you slip anywhere along it. We both breathed easier when we finally stepped onto normal ground again and started down to the back of Mistaya Lake in rapidly disappearing daylight, but finished with the main cruxes. 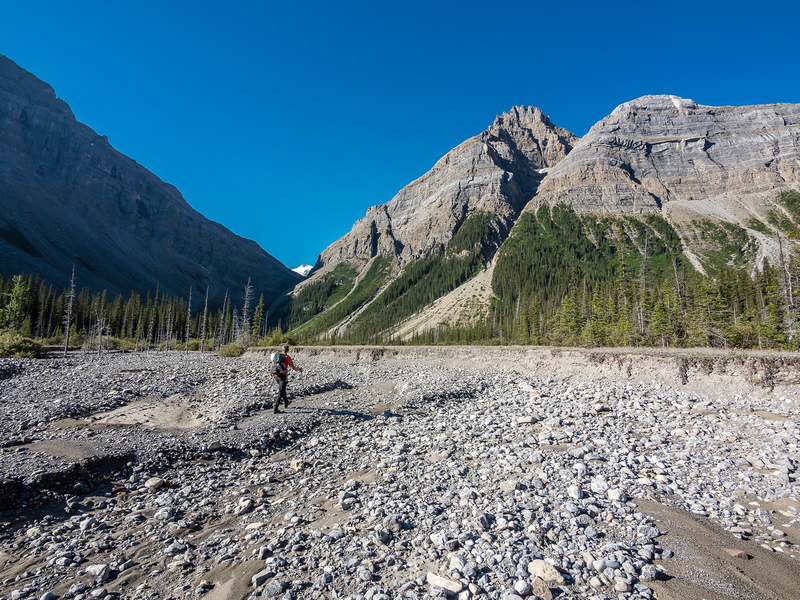 After hitting the gravel flats at the back of Mistaya Lake we instantly noticed that all the streams running down the flats were much higher and full of sediment than they were in the morning. Of course this makes sense on a warm summer day, but it got us thinking about several of the Mistaya River channels that we still had to cross. Breaker Mountain was becoming the gift that didn’t stop giving!! The Mistaya River isn’t quite as clear or pretty and calm as this morning! Mount Weed catches late sun in the background at right. 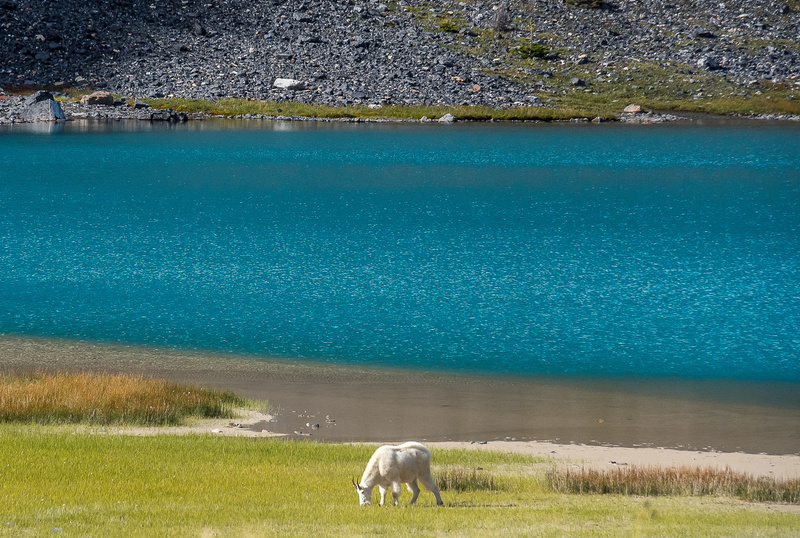 As we started back along the eastern shore of Mistaya Lake I decided that I was done with all delicacies. It was “go” time! I told Phil I wasn’t going to bushwhack and avoid the shallows along the shoreline, rather I was going to walk directly in the 4 to 12 inches of water and quit worrying about dry feet. Phil held back at first but soon we were both tramping happily along the soggy shallows between the shore and the lake – so much less stressful and easier than the bush! 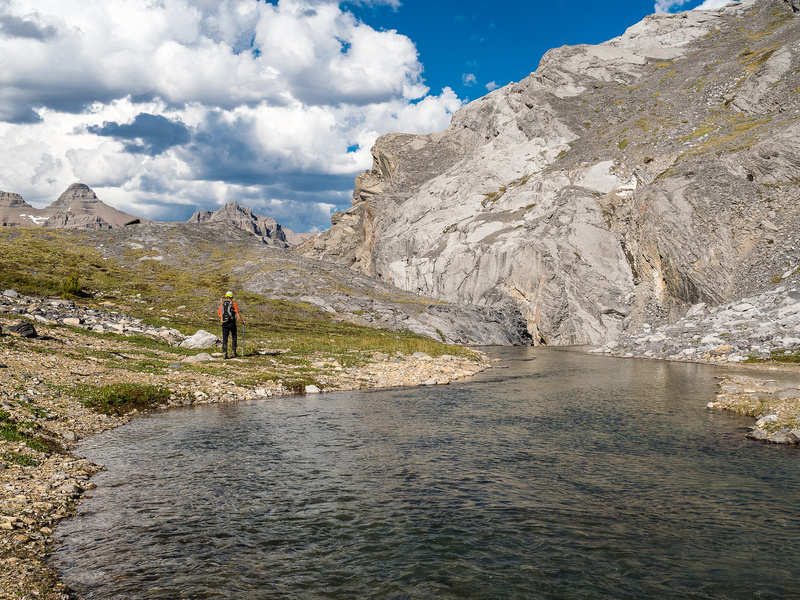 As we approached the Mistaya River I could hear its elevated roar and got a bit nervous. Phil confirmed our fears when he got the first look and said it looked “very fast” and “deeper” than that morning. It was both. We managed to get across all 4 or 5 channels but at least two of them gave us pause and threatened to lift us clear off our feet at times due to their volume. For a lot of folks this would have been another crux for sure. A great shot of the shallows we waded along on our exit. In the fall these are usually dry. We managed to follow our morning GPS track back through the trees to the Silverhorn Creek Campground and our vehicle where we amused some campers by not even slowing down for Silverhorn Creek – we just walked right through it like terminators. 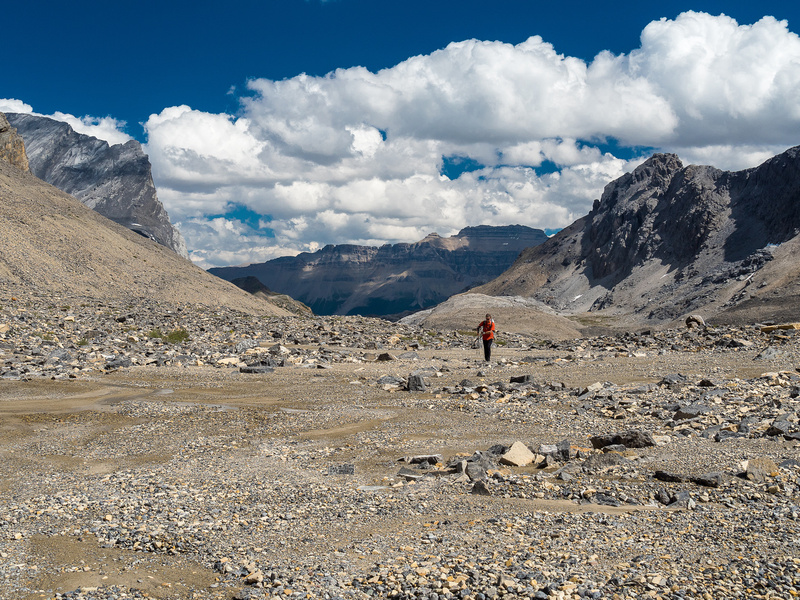 When a nearby camper asked where we came from, he got a glazed look in his eyes when I pointed to Breaker Mountain’s distant summit and told him we had to bushwhack, lakewhack, streamwhack and hike many kilometers including a crossing into BC to access it from the parking lot. I get a lot of these glazed looks from folks when I try to telling them what I do for fun. Maybe I should learn something from that? Nah. Seems pretty straightforward to me. I highly recommend Capricorn Lake as a destination in itself. If you manage to get all the way back there you’ve already gained a privileged memory that few other humans will ever get. If you manage to bash up a nearby peak it should be considered a pure bonus. Crossing Silverhorn Creek near the campground. he forest between the Silverhorn Creek Campground and Mistaya Lake is pretty thin as far as forests go. 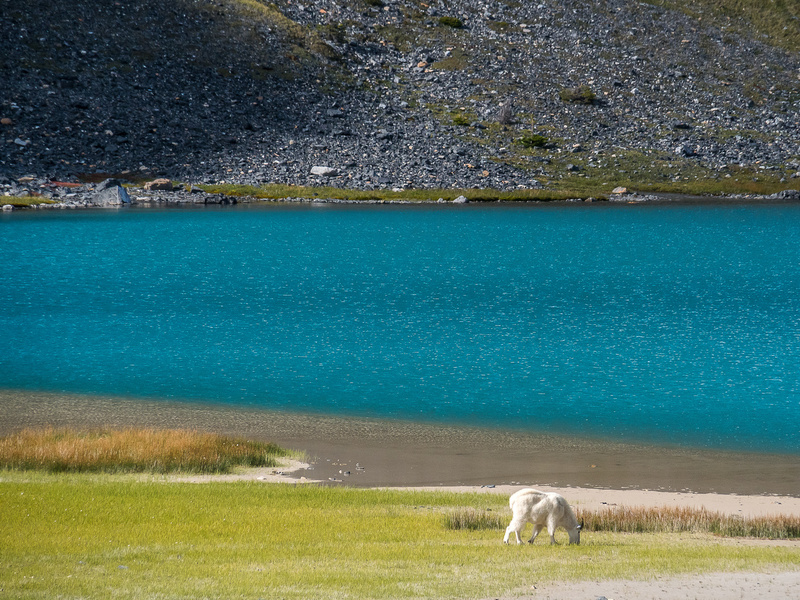 A lovely Mistaya Lake in morning calm. 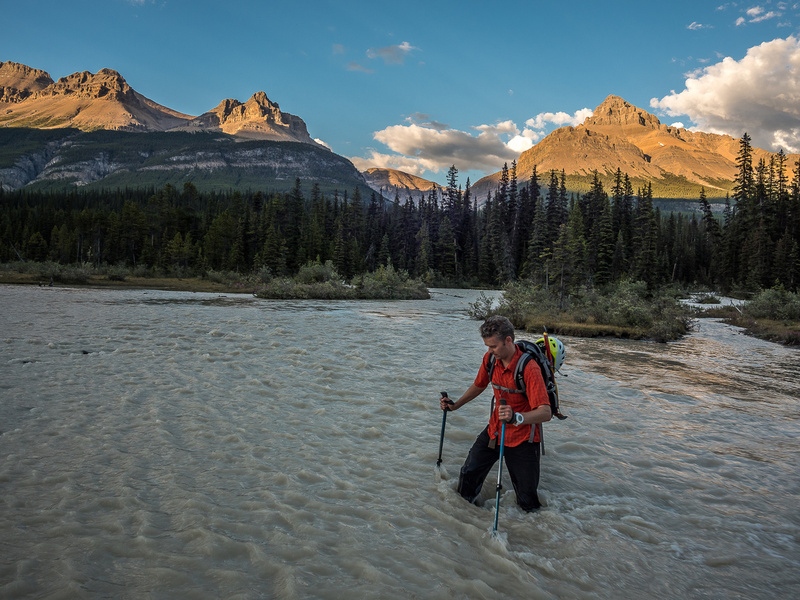 Crossing one of the Mistaya River's channels. We cross another channel of the Mistaya River - again note how nice and clear it is early in the day! 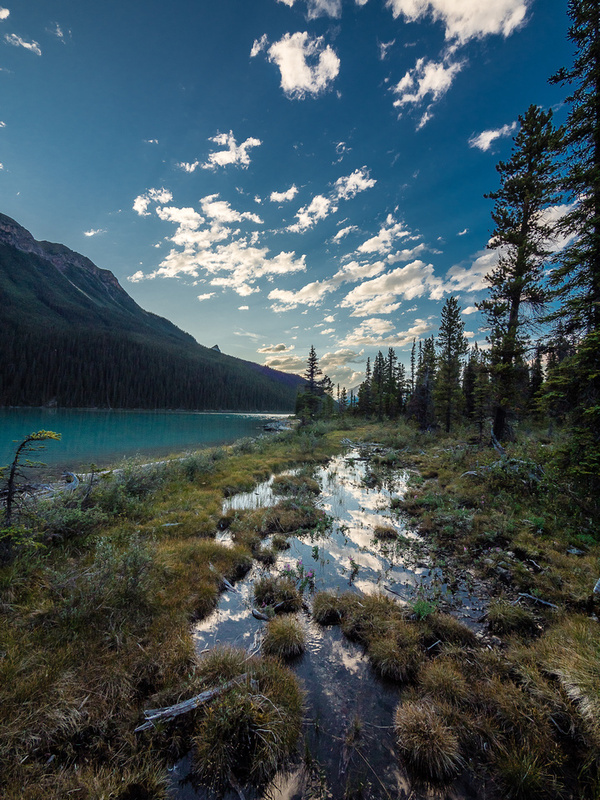 A magical spot at the back of Mistaya Lake where there's a natural gravel berm and more streams entering the lake - from both the Barbette and Capricorn Glaciers. A short bushwhack leads to the open avalanche slope which grants access to the hidden Capricorn Creek gully (L). This is the steep, loose gully we had to descend to access the base of the Capricorn Creek gully - out of sight to the right here. 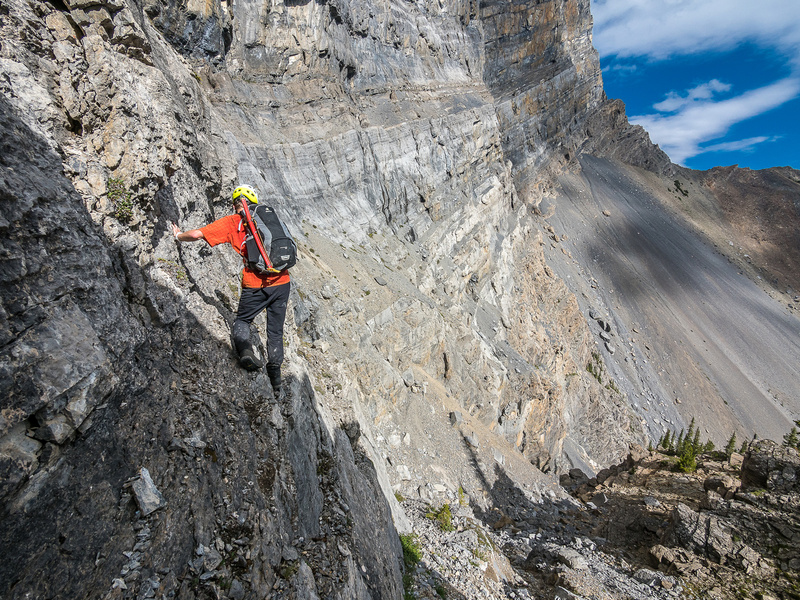 Phil clambers up steep, rock-hard scree to the base of the Capricorn Creek gully. Phil looks pretty small in the lower Capricorn Creek gully. Again - notice the incredibly loose terrain above him here. For now this is just a slick section of the gully. On descent this was covered in running water making it extra spicy to descend! Gorgeous scenery in the gully - this is where we crossed to climber's left to continue upwards. We've now crossed the raging stream and are climbing up to the third crux. It's tough to get a sense of how exposed this ledge traverse feels a bit further on. Put it this way - there's a reason I don't have more photos of it! The keyhole above the ledge traverse. The only human sign we saw all day marks the entrance to the ledge traverse. 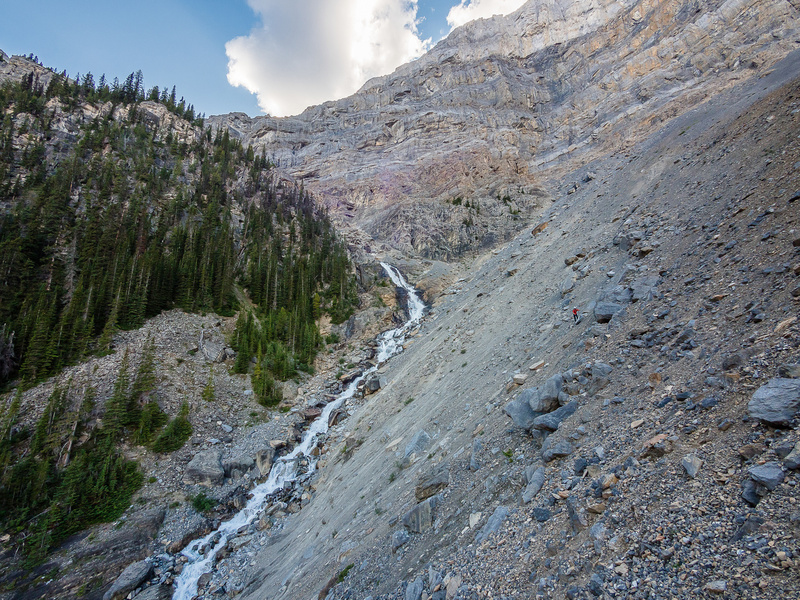 We crossed the outlet stream from Capricorn Lake here to climber's right and then up a short scree ramp to finally escape the access gully. Parapet rising on the left in the distance with Capricorn Lake and Breaker Mountain to its right. 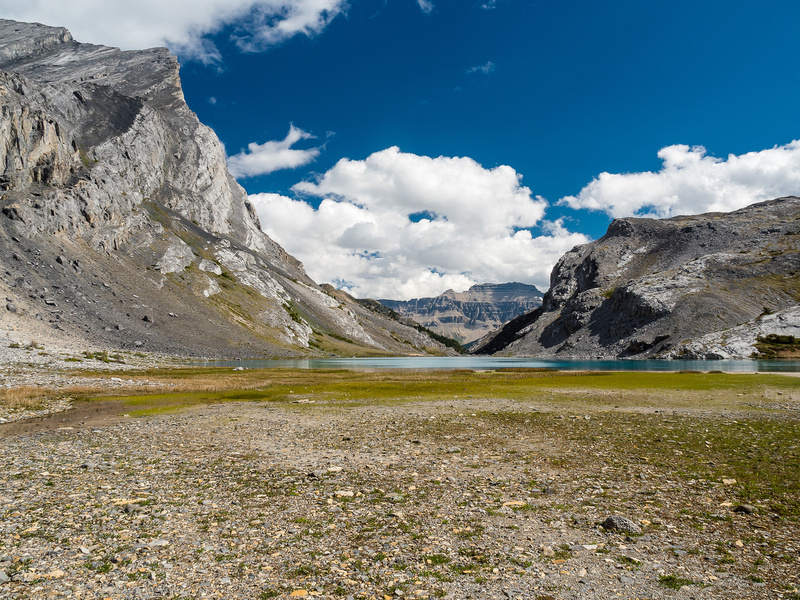 This is looking back at Capricorn Lake after hiking alongside it. An outlier of Aries on the left and unofficial "Capricorn Peak" on the right. Aries Peak shows up at upper left with Capricorn Lake visible at center in this view looking back from the moraines. Looking over Upper Capricorn Lake towards the Parapet / Breaker col. Nearing the col, looking back at "Capricorn Peak" (unofficial) on the right. This was our easy backup plan in case Breaker didn't go. The retreating Parapet Glacier looks like a good access point for the main peak which is out of sight at upper right. I've called the tarn in the foreground, "Parapet Tarn". We break over the col and head into BC, trying to find an access to Breaker on our right. 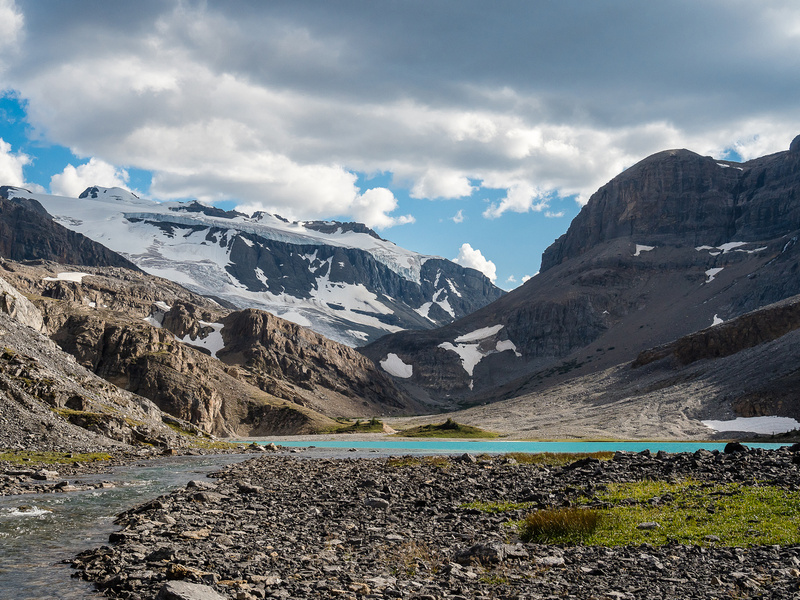 The Mummery Icefield at center distance. A view of the chimney breaking the line of cliffs that skirt almost the entire upper mountain. Looking back at our approach and Parapet Peak from part way along the traverse to the ramp. Looking back out of the chimney towards Parapet (R) and Patterson (L). We did a lot of wandering around in the chimney trying to avoid 5th class and very loose sections. I love this shot of Phil traversing from the top of the chimney to the easier scree ramp that would finally break through to the upper mountain. At this point we're next to the scree ramp (R) that breaks through the cliffs. This is looking back at Phil finishing the traverse. Amazing scenery as we start the long trudge up the snow / glacier towards the distant summit of Breaker - 1.5km distant at upper right. Does this thing EVER END?! 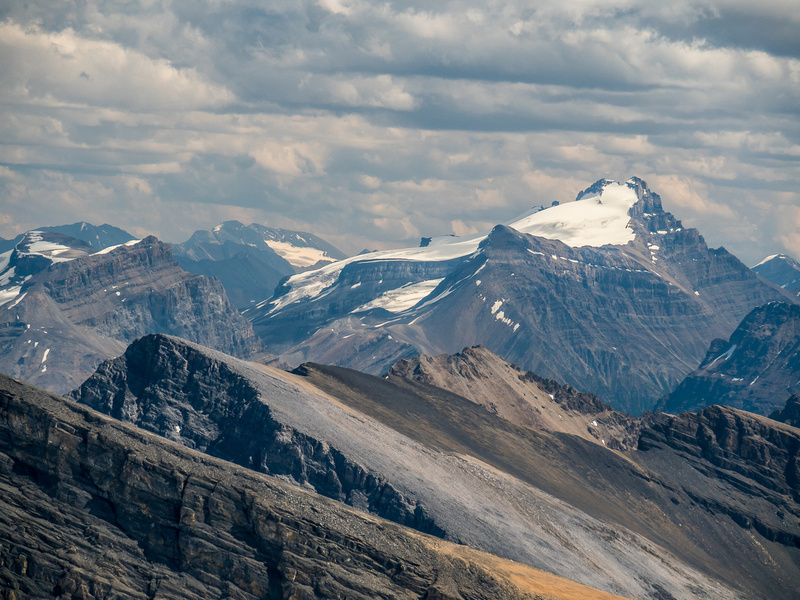 Stunning views off the south ridge of Breaker looking south towards the Wapta Icefields with Mistaya Lake and our starting point just visible at far left. 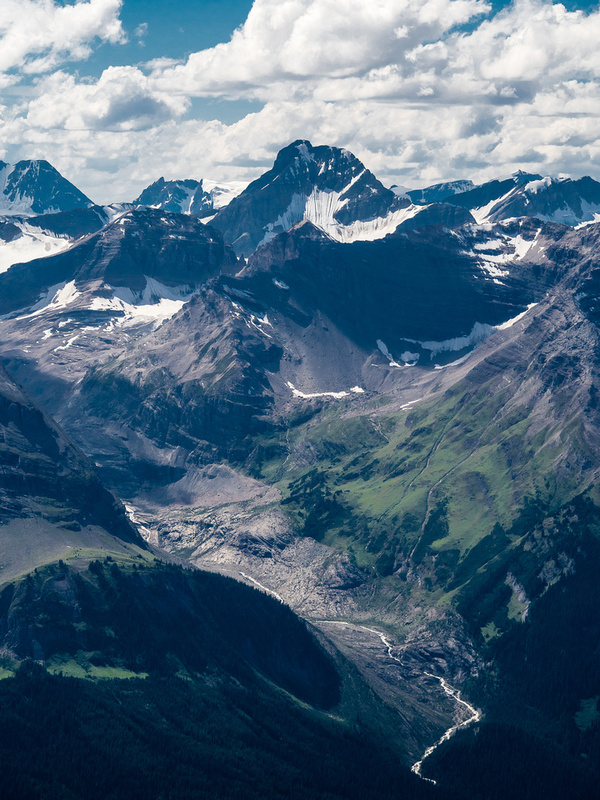 (L to R), Howse, Chephren, Murchison, Corona Ridge, Noyes, Weed, Silverhorn, Mistaya Lake, Capricorn Lake and Mount Patterson. Mount Patterson is a beautiful peak to the SE of Breaker. I skied it in February 2012. Willingdon, Crown and Willingdon South Tower to the SE. 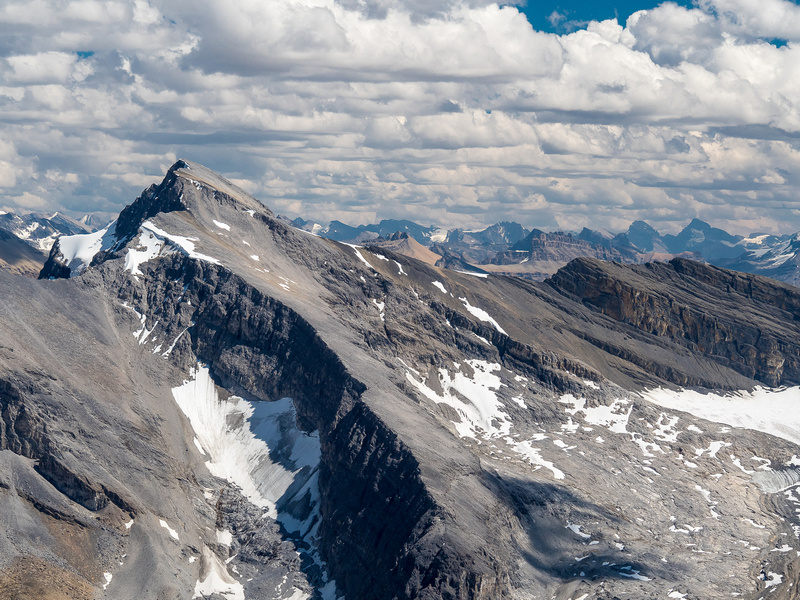 The very impressive form of Recondite Peak with Augusta to the far right. Howse Peak and Mount Chephren to the north. Mighty Mount Murchison to the NE. 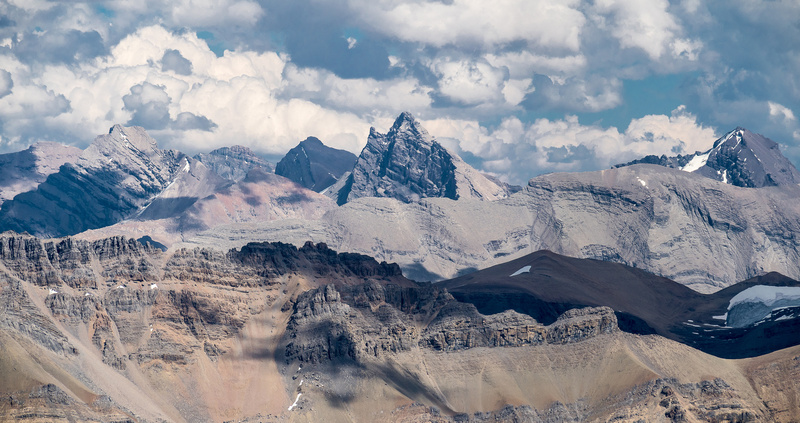 Totem Tower, Spreading Peak and Corona Ridge (L to R) to the NE. Andromache, Little Hector and Mount Hector across hwy 93 to the SE. Collie and Ayesha which I climbed in the spring of 2013. WTF?! 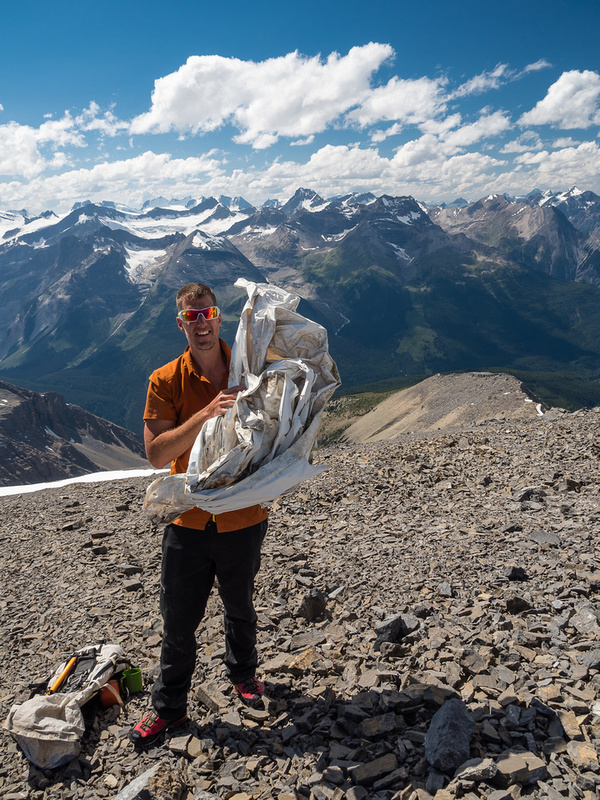 Garbage at this rarely visited peak was rather disappointing but I carried it down so the next folks that venture up here don't have to see it. 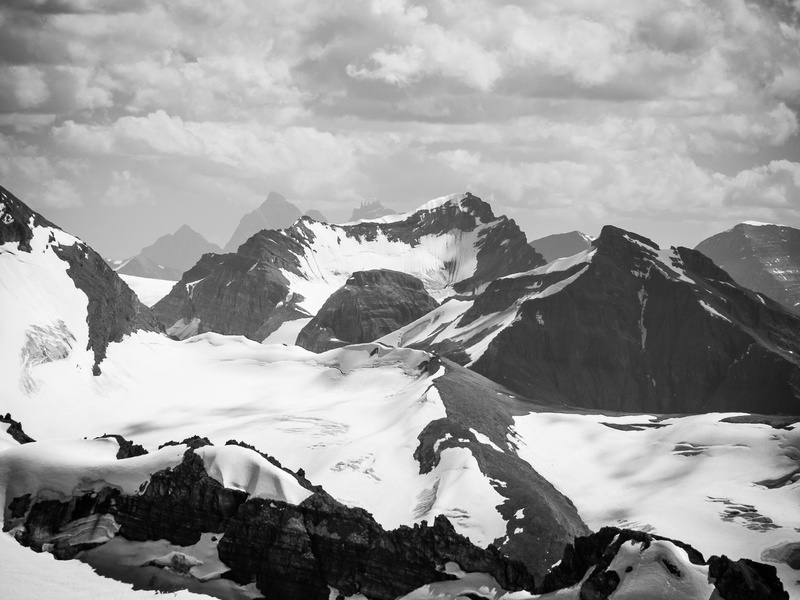 Mummery, Freshfield and Lyell Icefields and peaks along the divide to the north including Howse, Aiguille, Midway, Stairway, Aries and Ebon Peak. Mistaya and Capricorn Lakes at right. (L to R), Forbes, Christian, Walter, Ernest, Edward, Rudolph, Arctomys, Columbia, Outram, South Twin, North Twin. (L to R), Cairnes, Fisher, Mummery, Barlow, Low, Whiteaves, Nange Parbat, Trutch, Barnard, Bulyea, Walker, Prior, Pilkington, Solitaire and Conway. 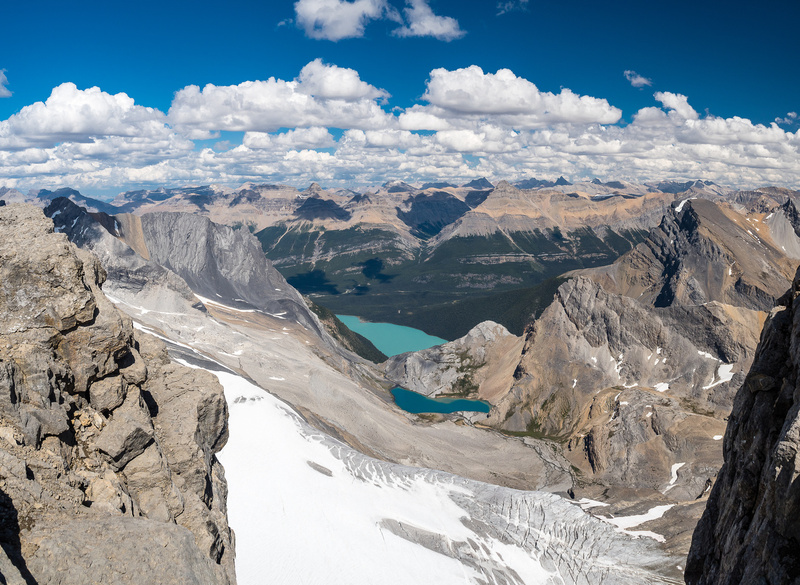 Great view of Capricorn and Mistaya Lakes through a gap in the summit ridge. Phil descends the glacier on Breaker's west flank. This part of the descent was very fast thanks to the snow. Traversing scree slopes back around the west and south flanks of Break to the Parapet Col which is still out of sight to the left here. An interesting dried up tarn with the unofficial "Capricorn Peak" rising at right. 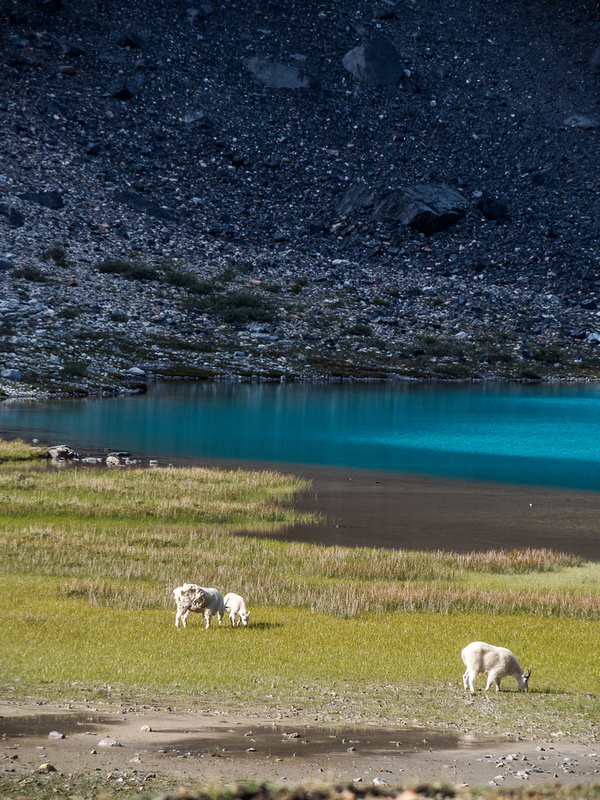 Mount Goats at Capricorn Lake. One of my favorite Rockies animals - a gorgeous mountain billy goat grazes near Capricorn Lake. Some last glances back along Capricorn towards Parapet (C) and Breaker (R) in late afternoon lighting. These animals know how to scramble!! Find the family of goats at the top of this photo. Phil marches towards the Capricorn Valley exit and top of our escape gully. A last glance back at Capricorn Lake and Breaker Mountain. Looking along the crux #3 wall with the exposure down to the right. Fun in the escape gully! Looking up at the 2nd crux - you must pass the giant boulder at upper right on it's right side. This doesn't look like a 'crux' but it is. 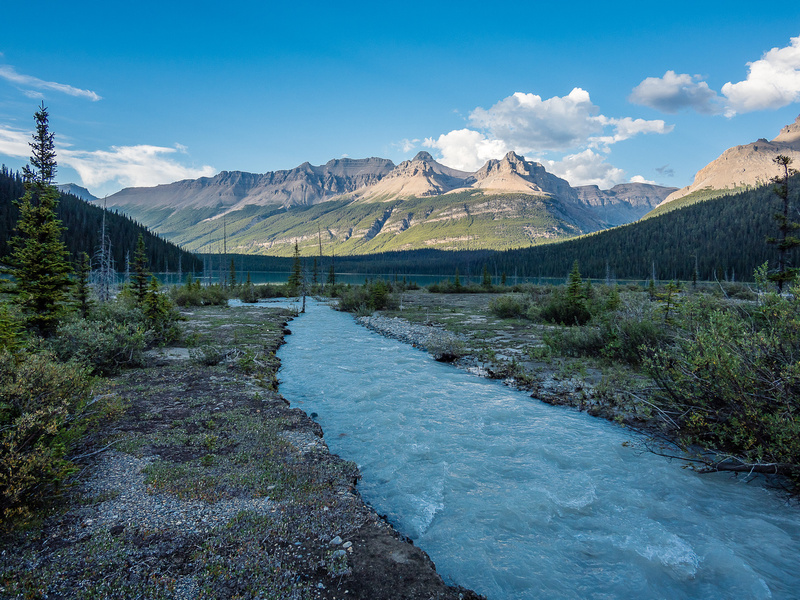 All the streams running into the south part of Mistaya Lake seem to be full of sediment and running a lot faster and higher than earlier in the day! 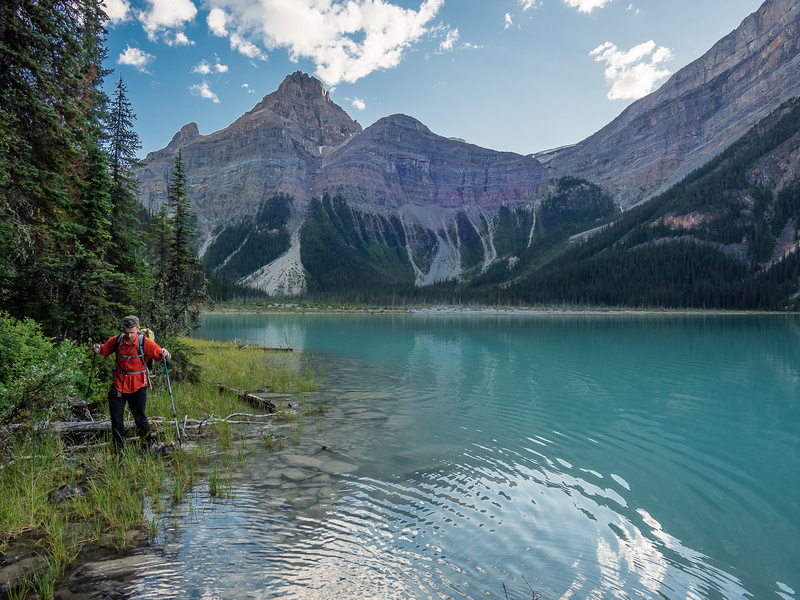 Looking back at Phil as we both walk directly in the shallows of Mistaya Lake on our exit. There were short stints where the bush was unavoidable due to deep lake water. The Mistaya River isn't quite as clear or pretty and calm as this morning! Mount Weed catches late sun in the background at right. A peaceful calm settles over Mistaya Lake as we continue our exit.